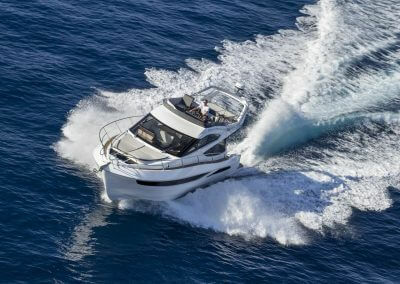 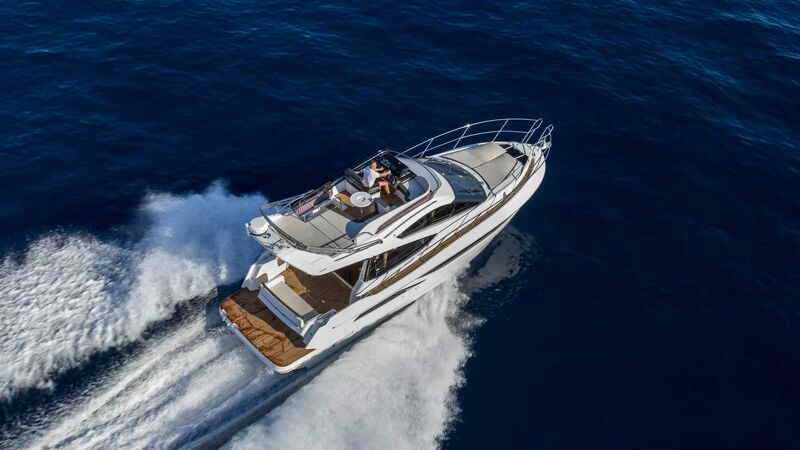 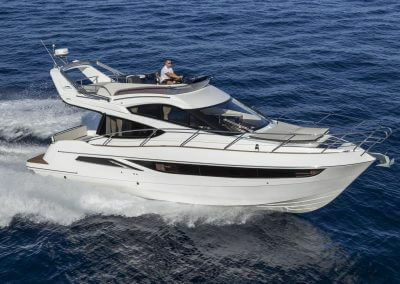 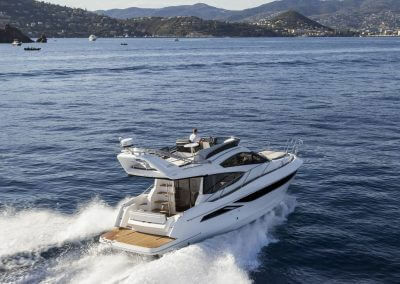 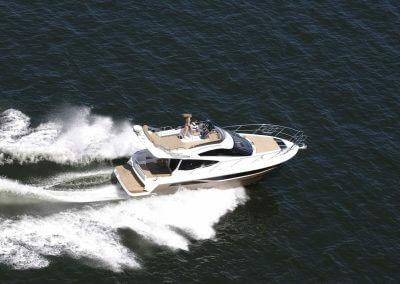 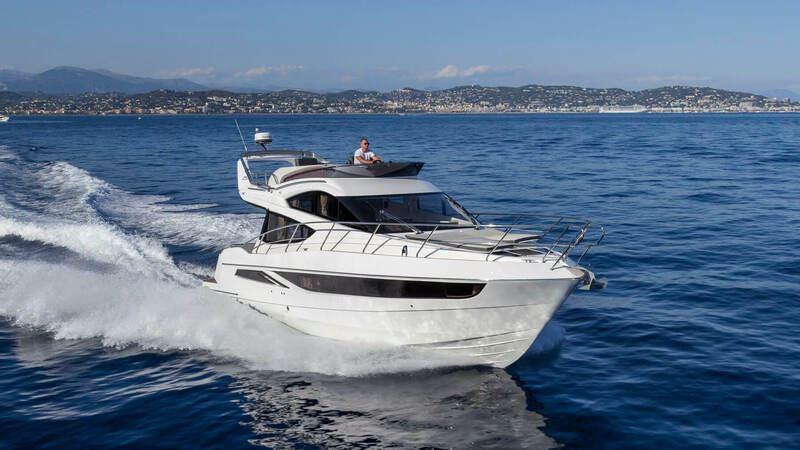 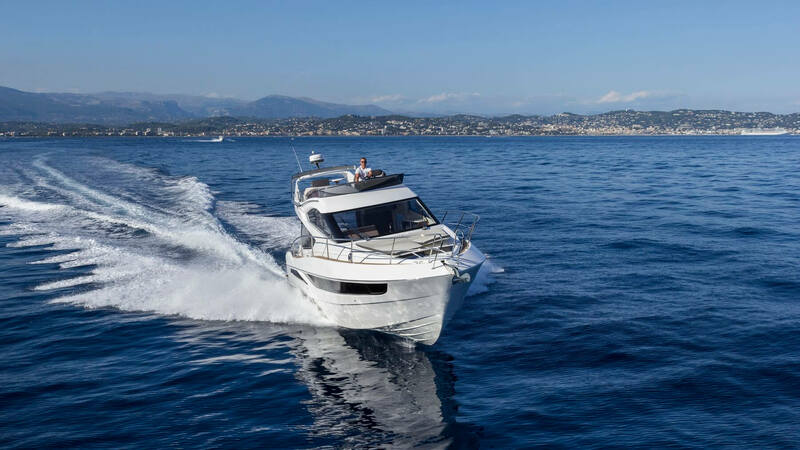 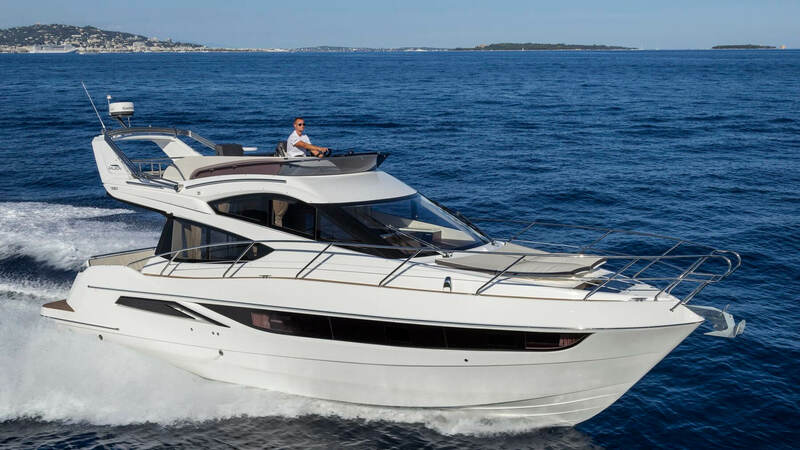 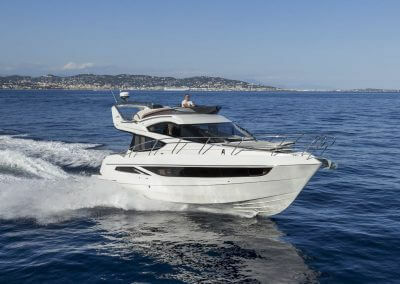 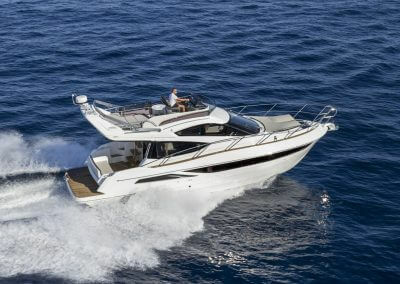 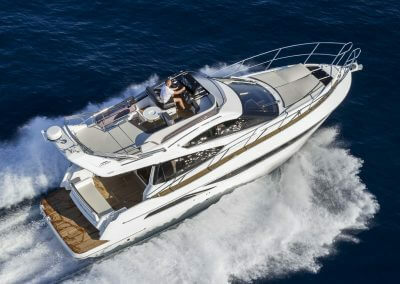 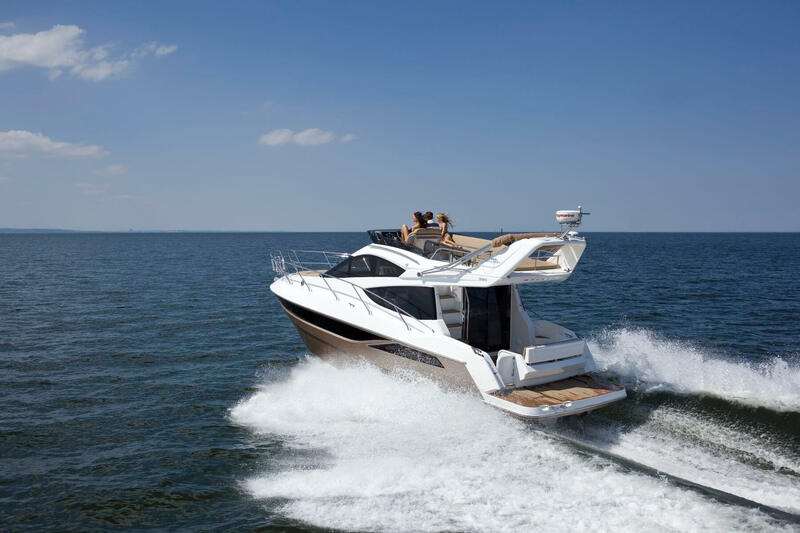 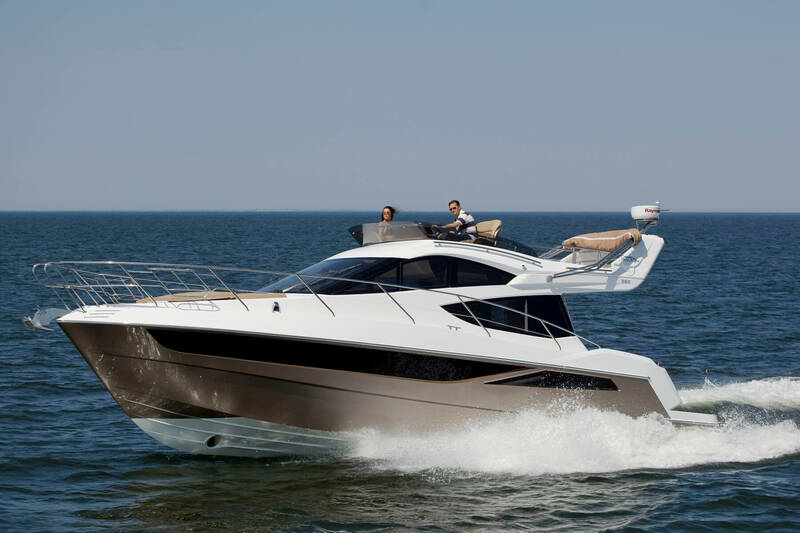 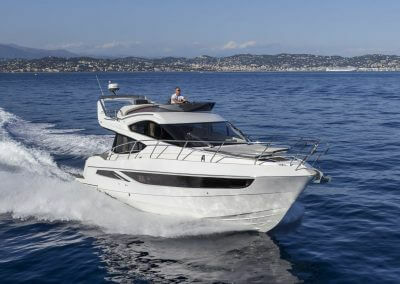 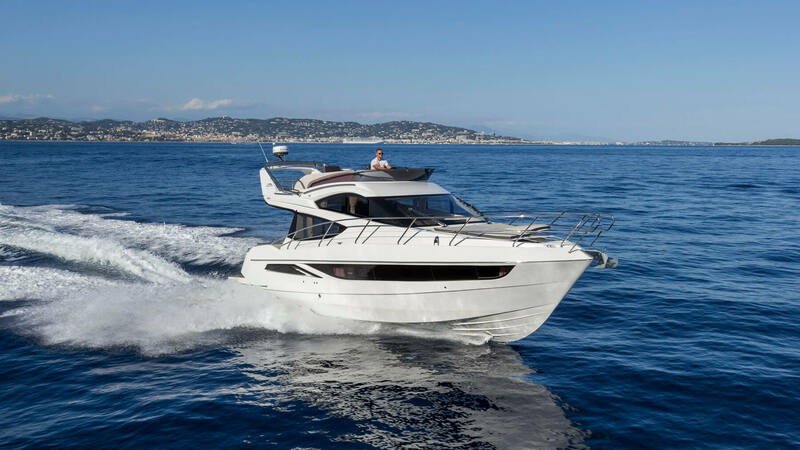 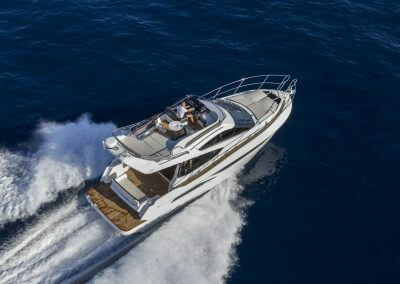 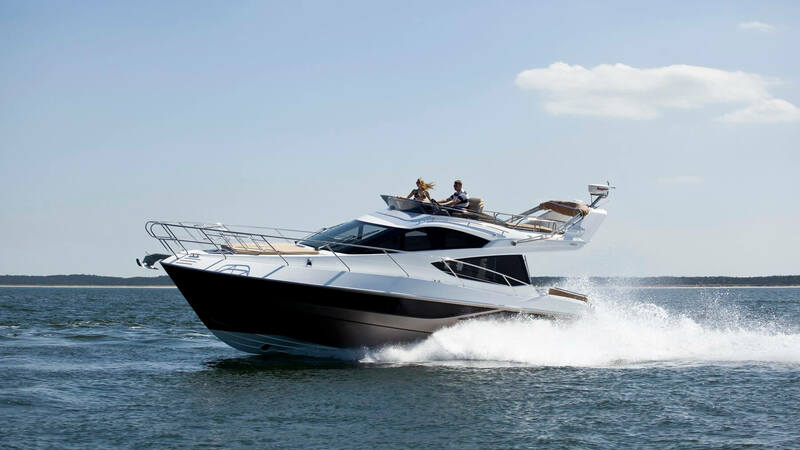 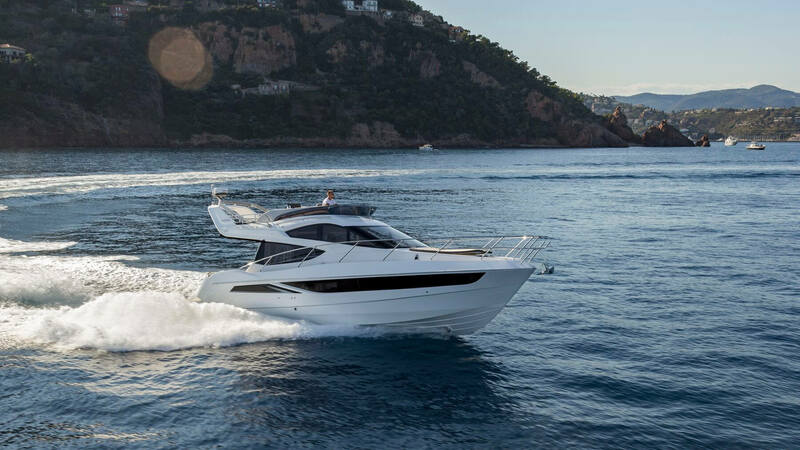 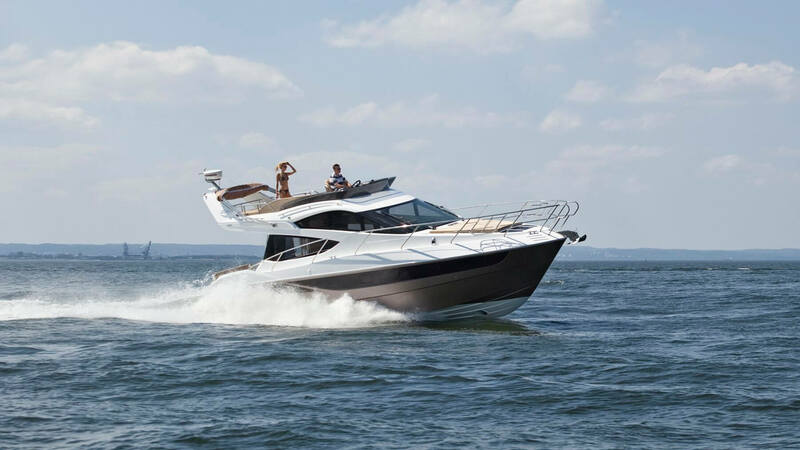 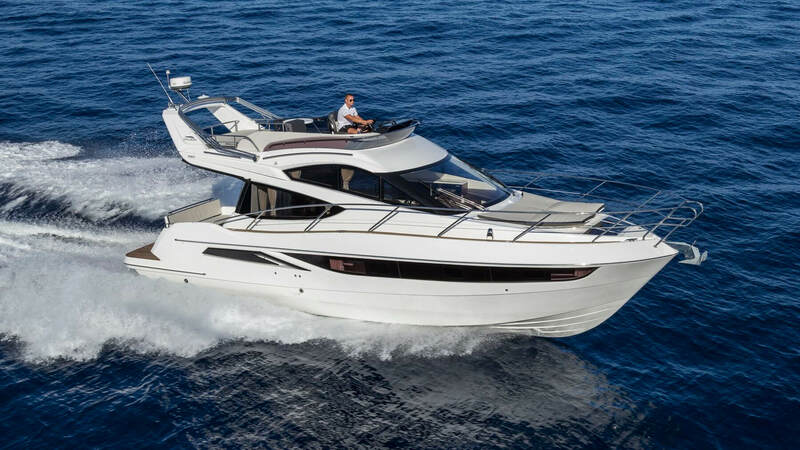 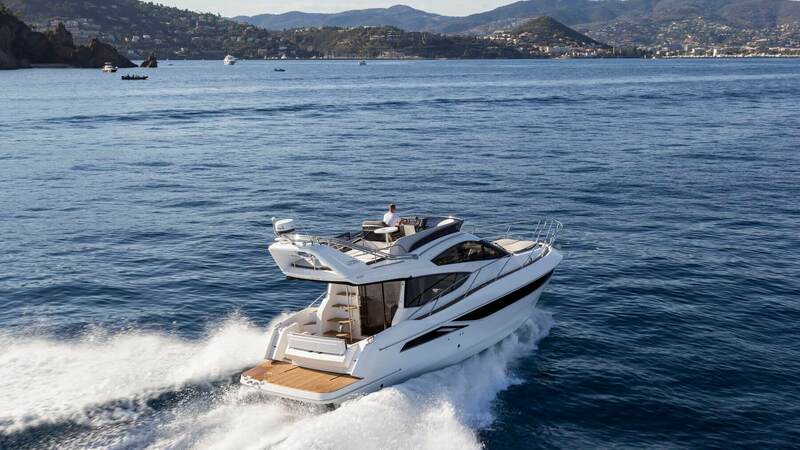 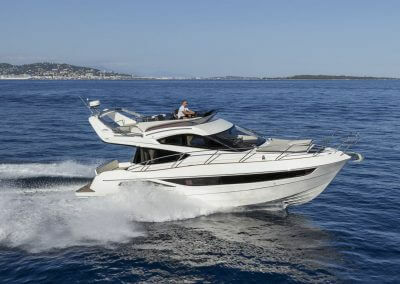 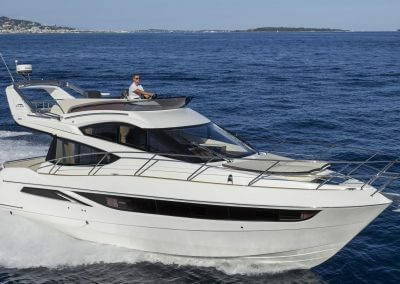 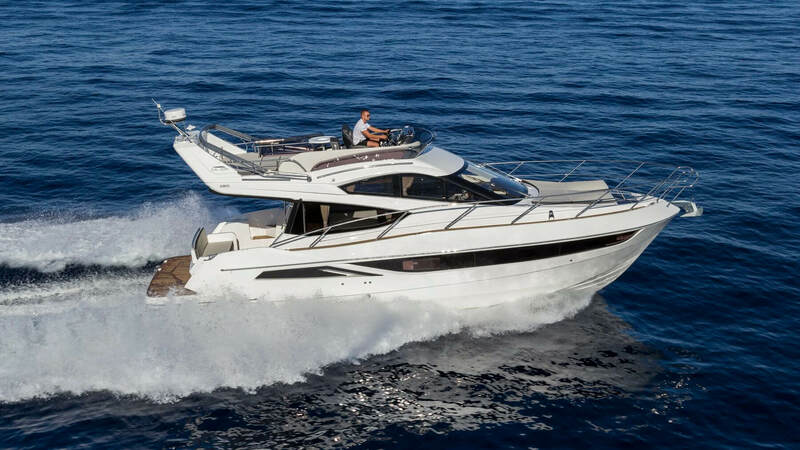 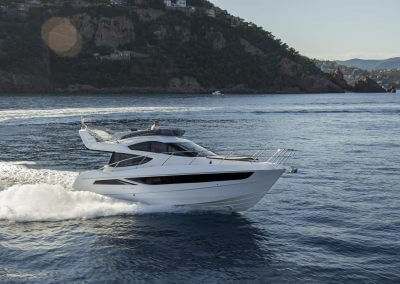 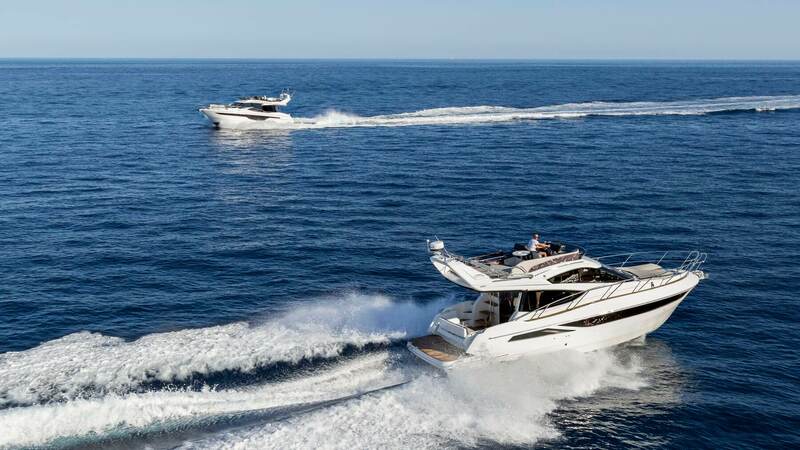 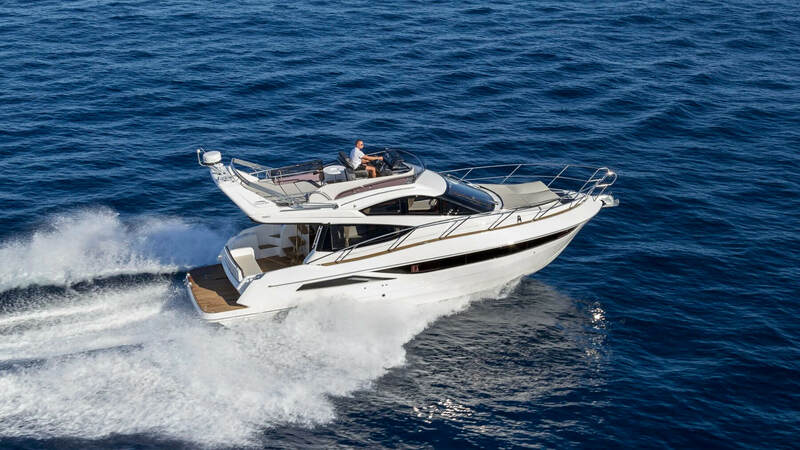 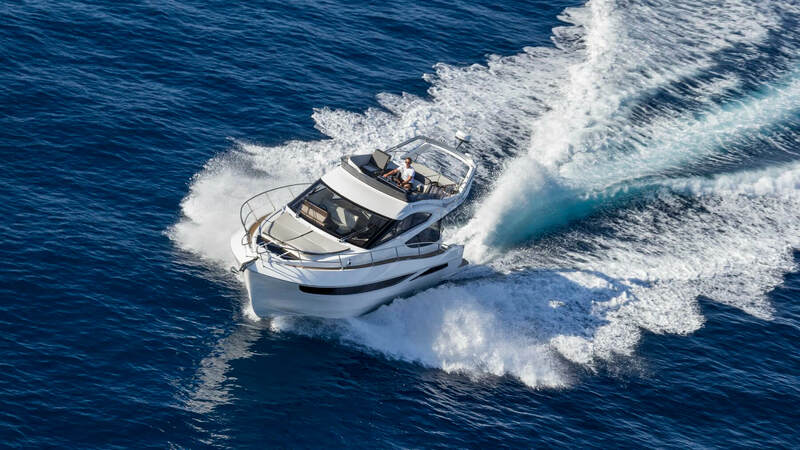 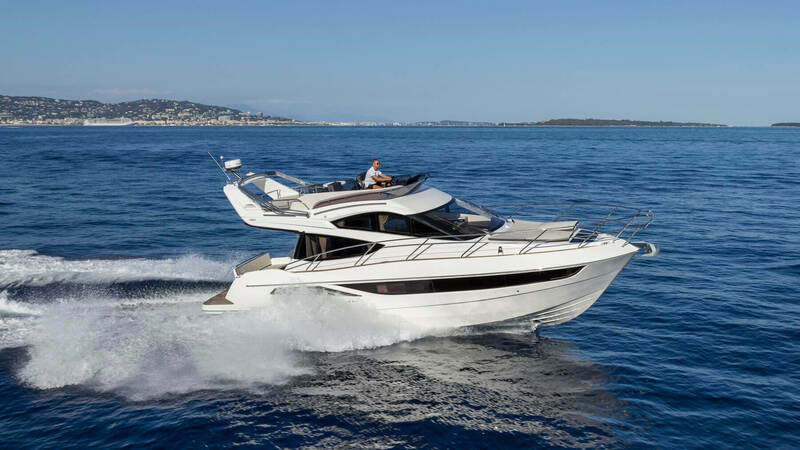 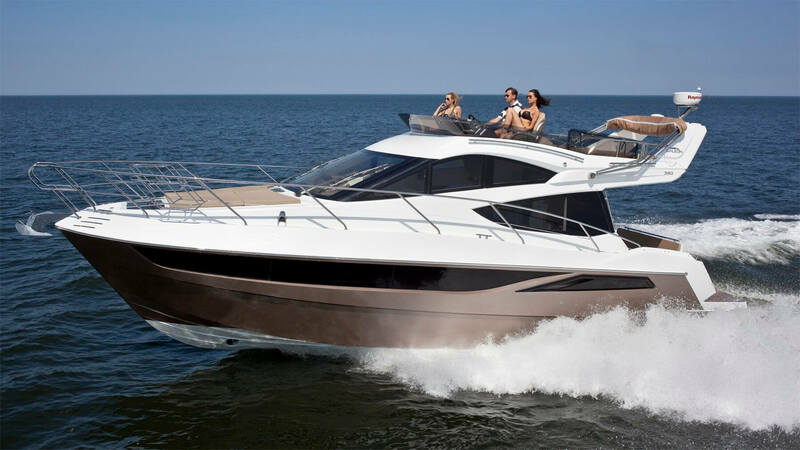 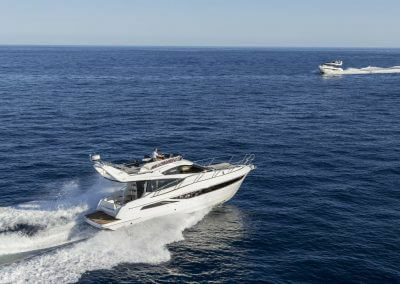 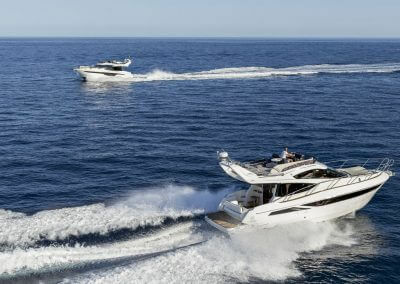 The yacht’s sporty silhouette quickly catches the eye with its hull-length windows, aggressive lines and ample flybridge. 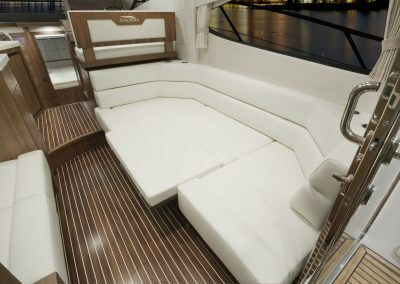 Outside, the aft-facing sundeck welcomes you with a transformable, fold-out settee with adjustable lumbar support. 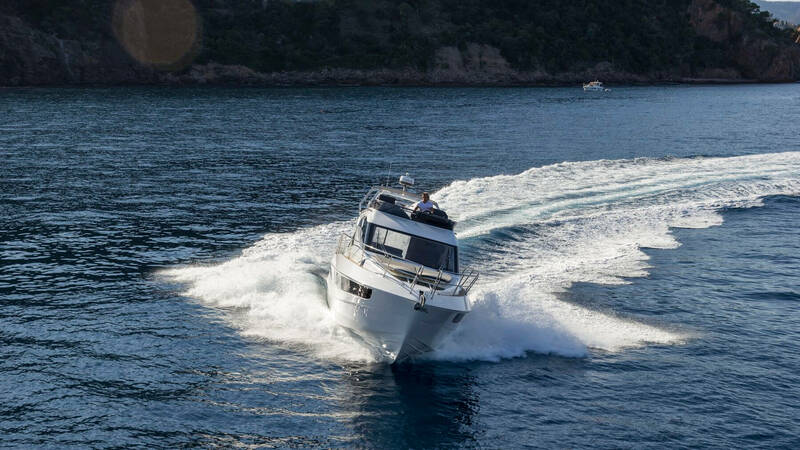 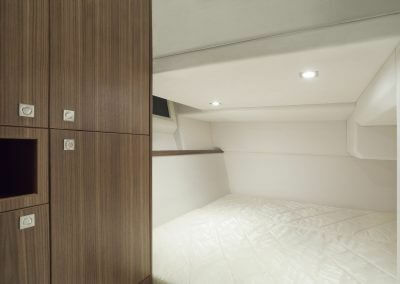 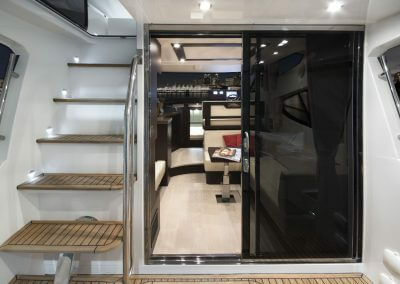 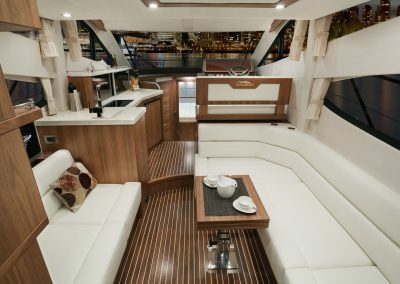 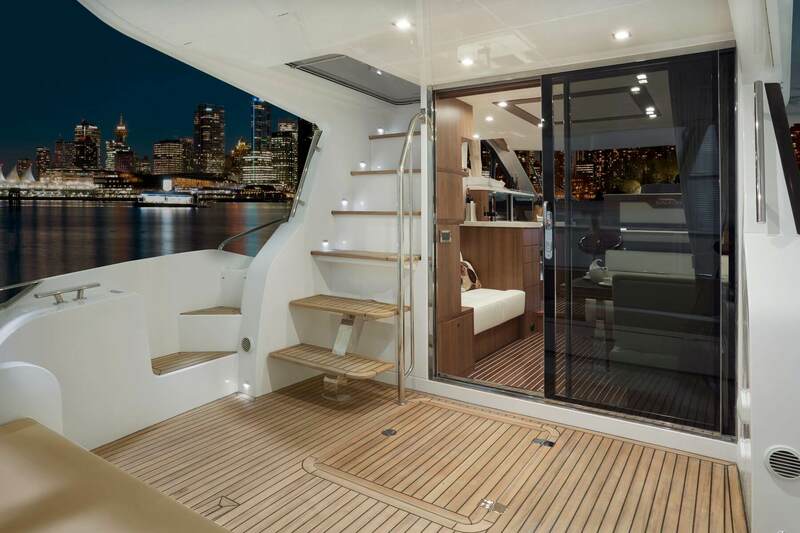 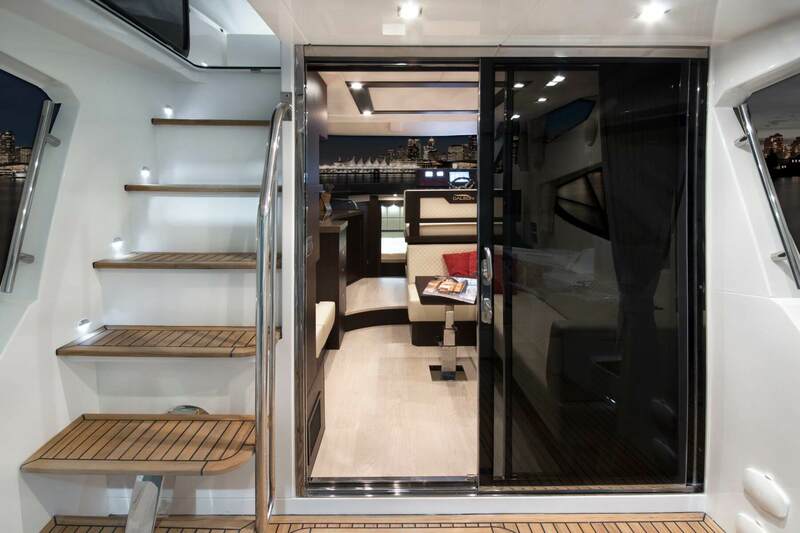 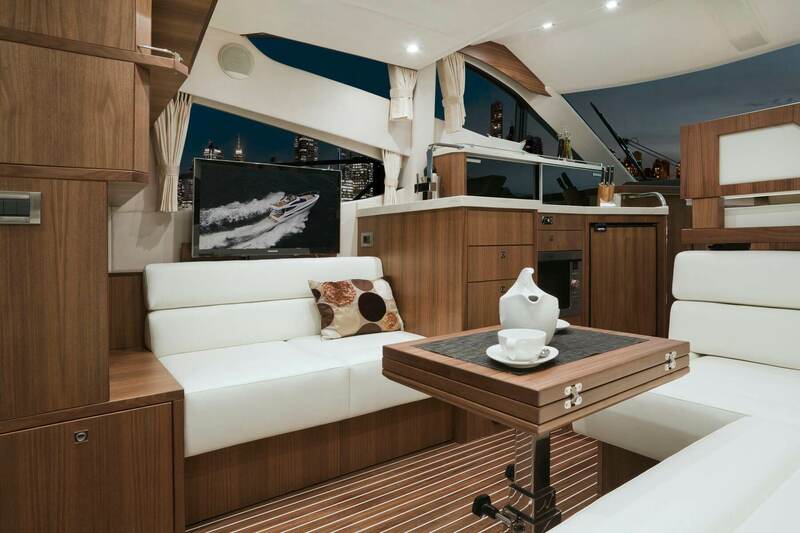 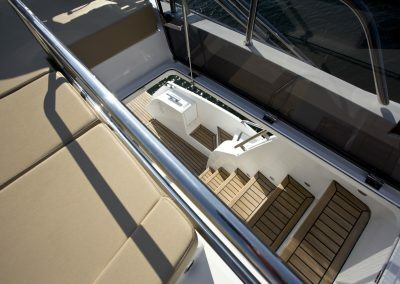 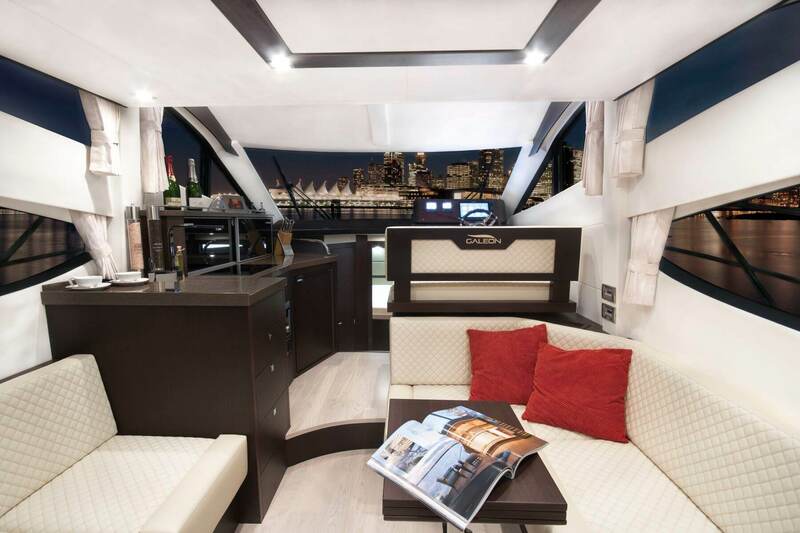 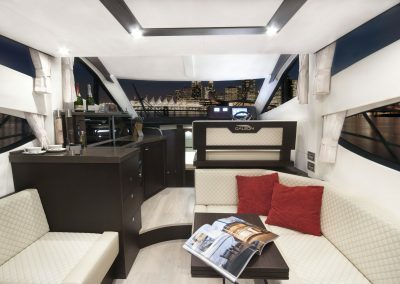 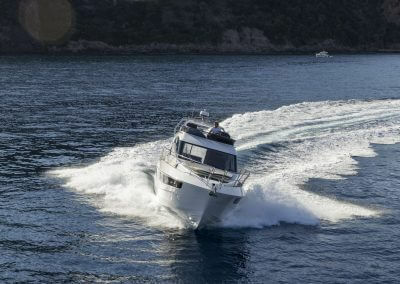 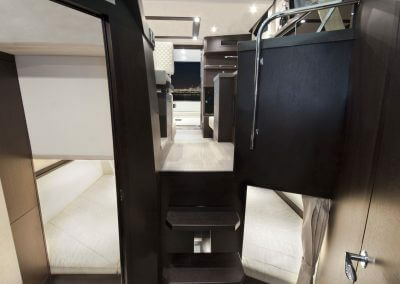 The generous side decks and practical handrails are great for crew while mooring and sailing rough seas. 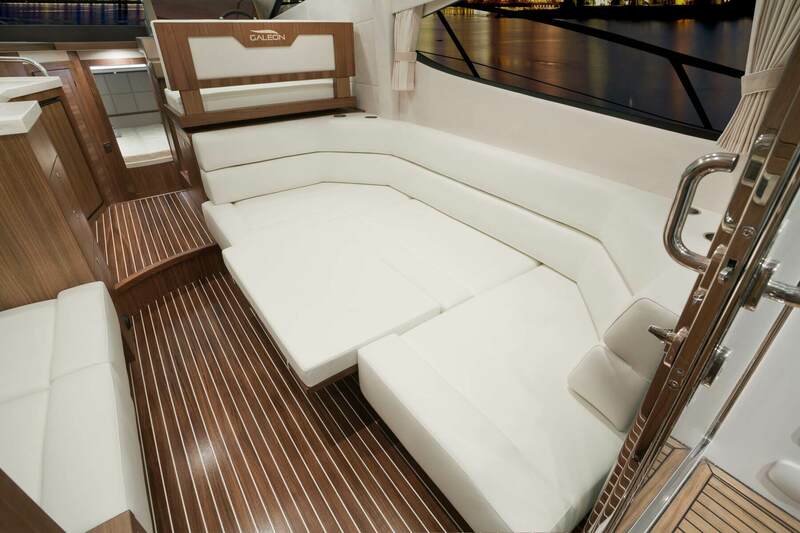 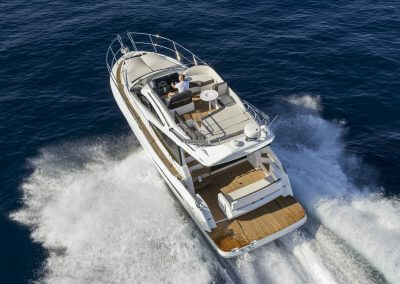 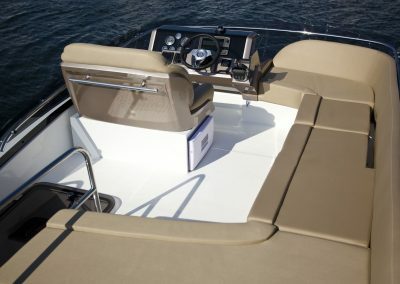 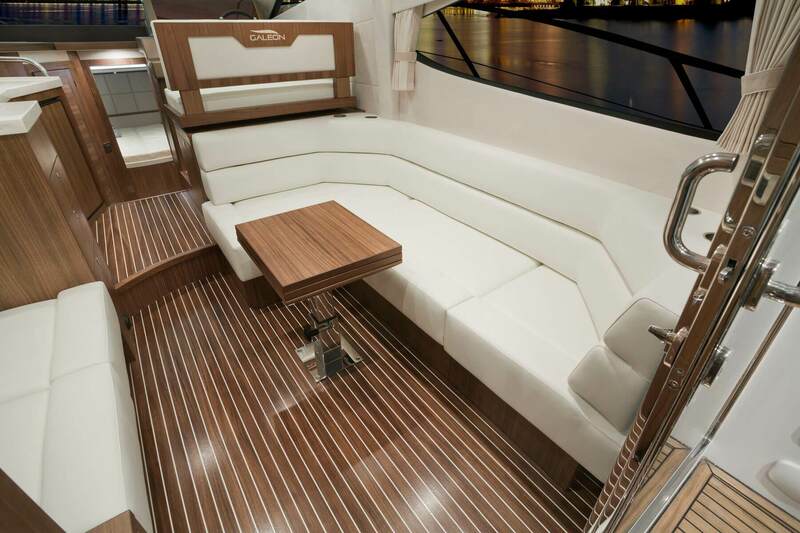 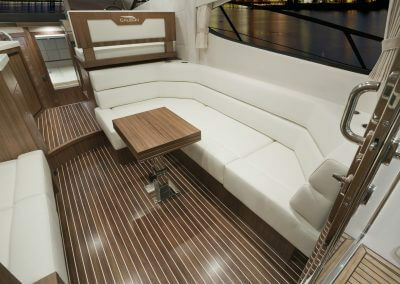 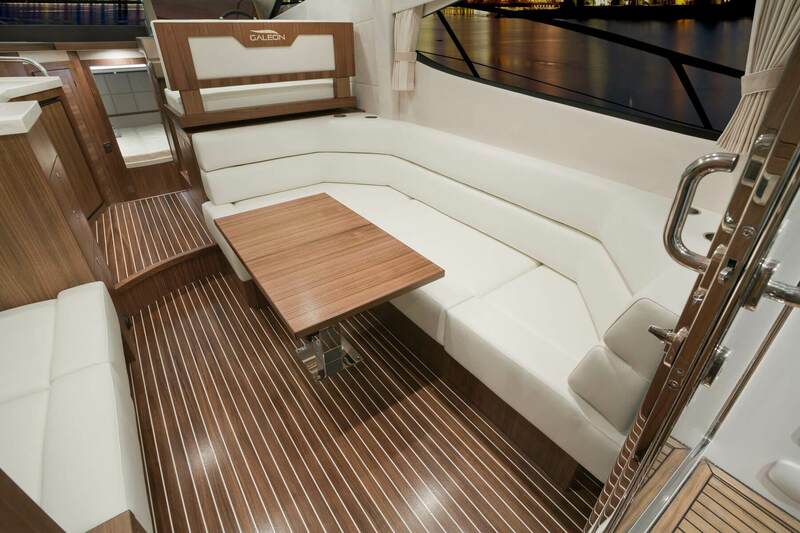 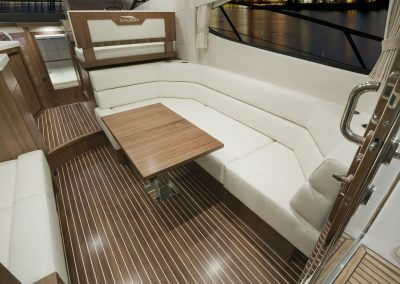 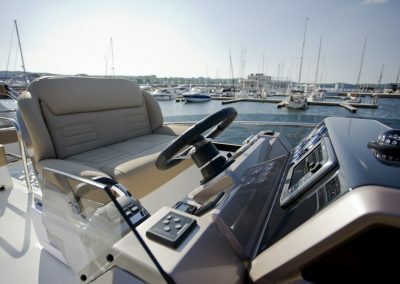 Follow them to the bow sundeck with conveniently placed cup holders and a regulated headrest for additional back support. 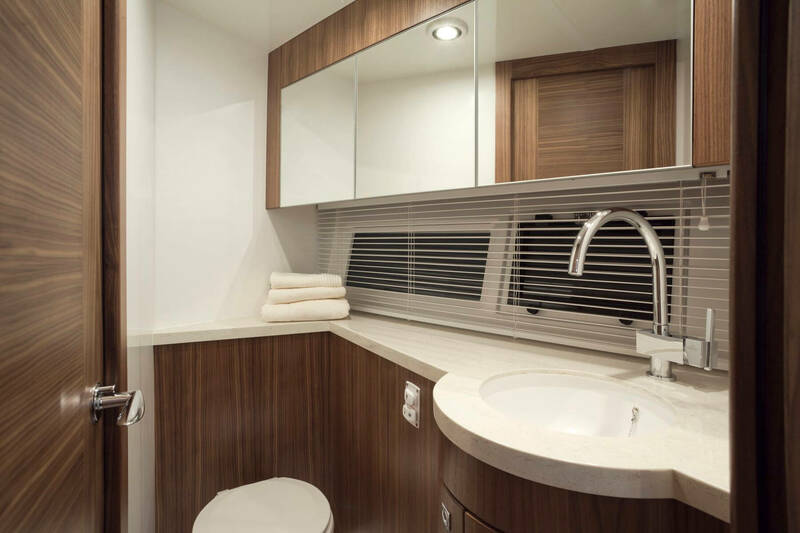 The design team has dedicated a tremendous effort to make the interior as bright and welcoming as possible. 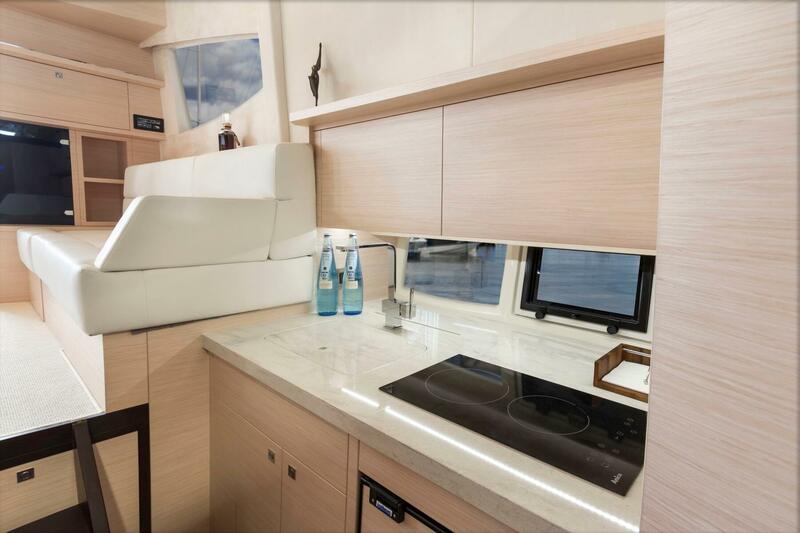 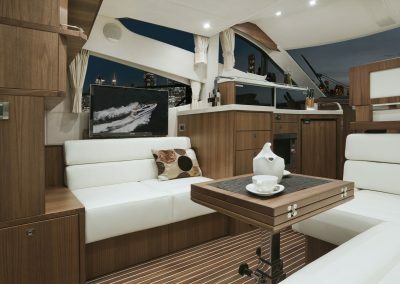 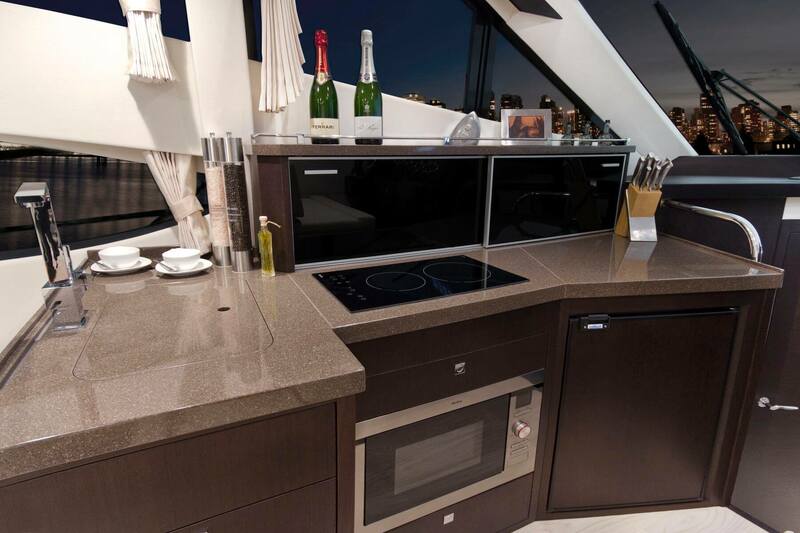 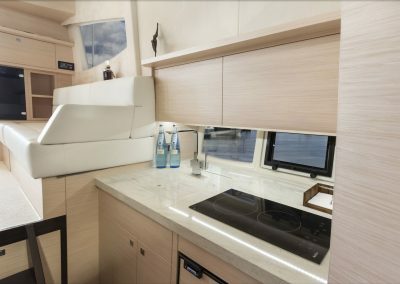 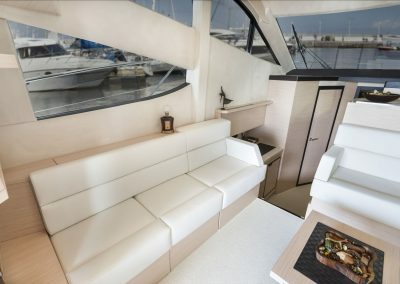 On the main deck find a comfortable dinette, helmsman’s station and a galley that can be moved down below in the two-cabin version. 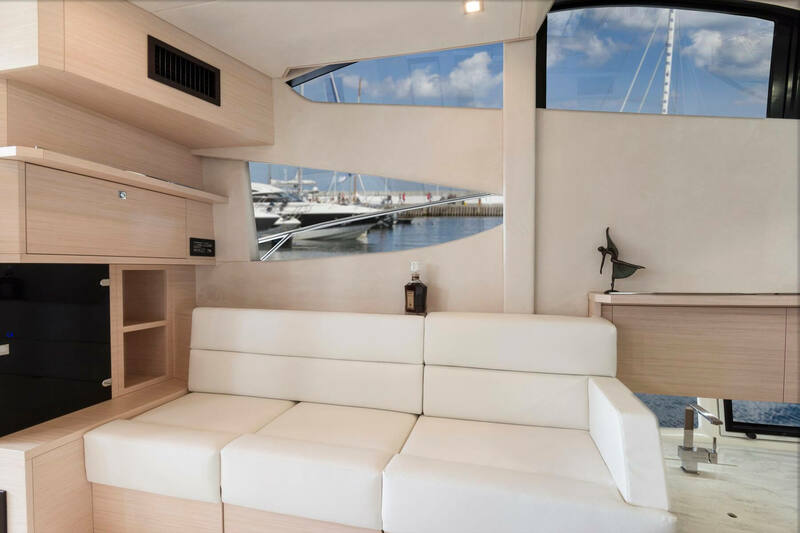 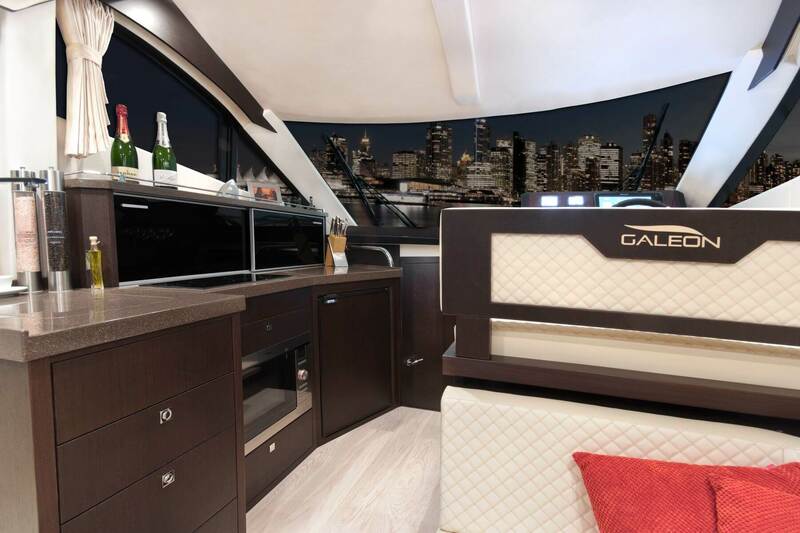 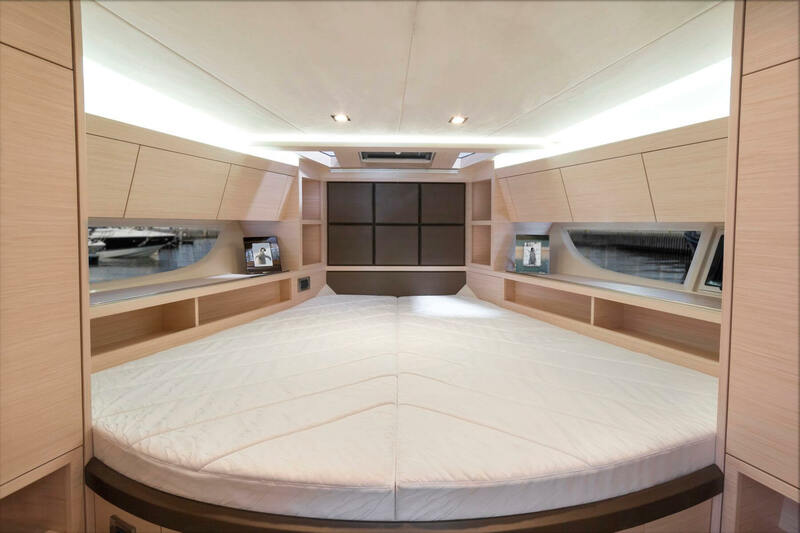 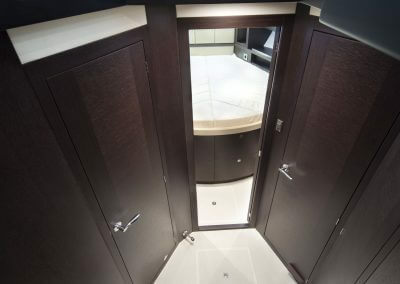 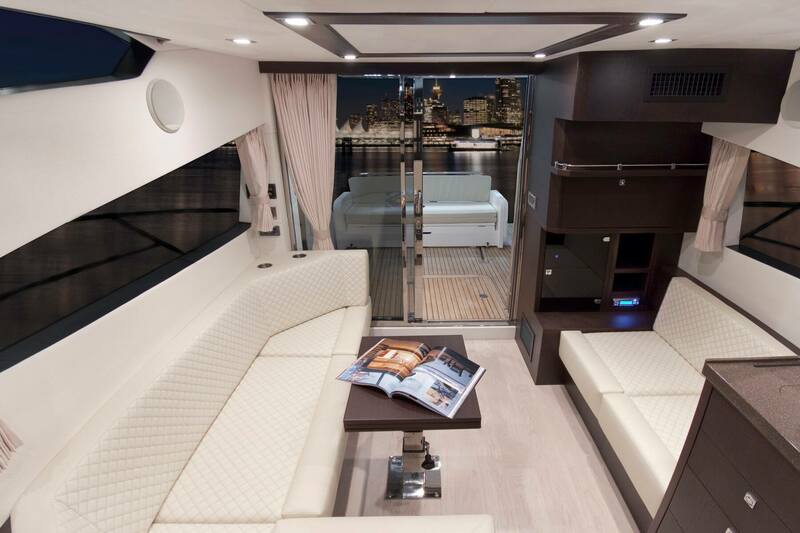 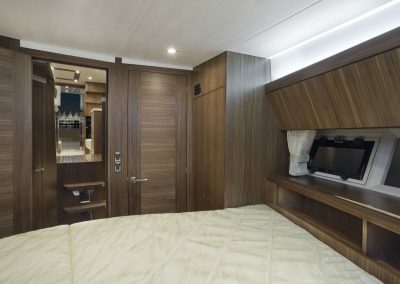 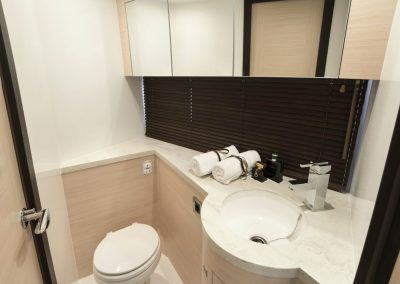 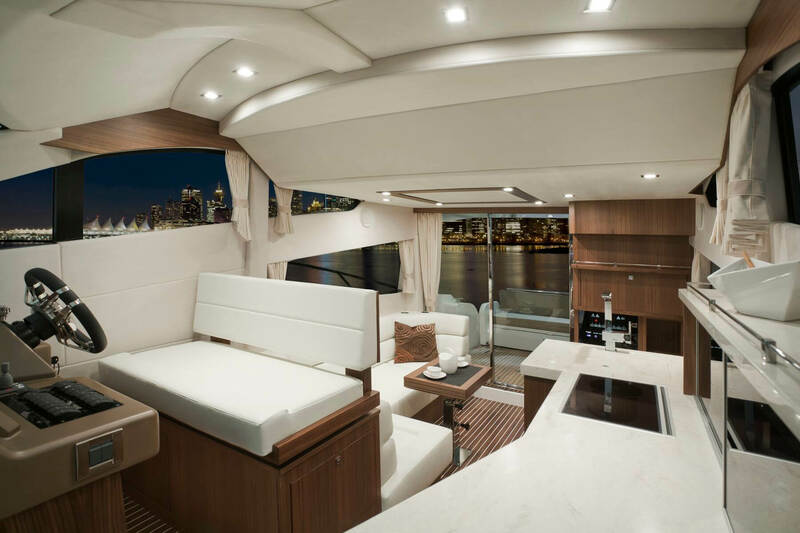 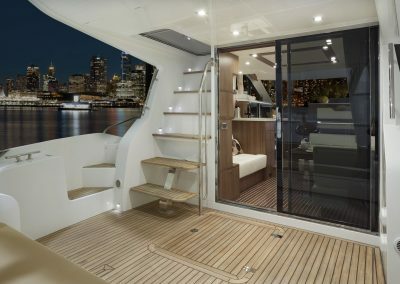 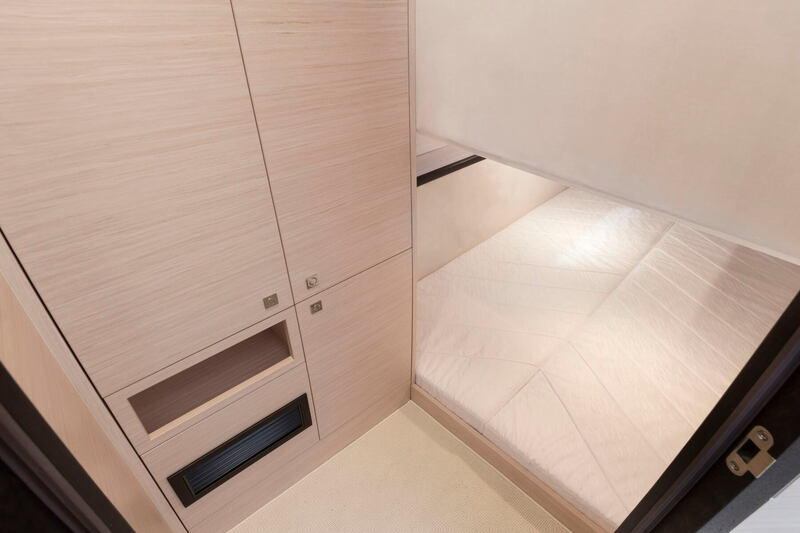 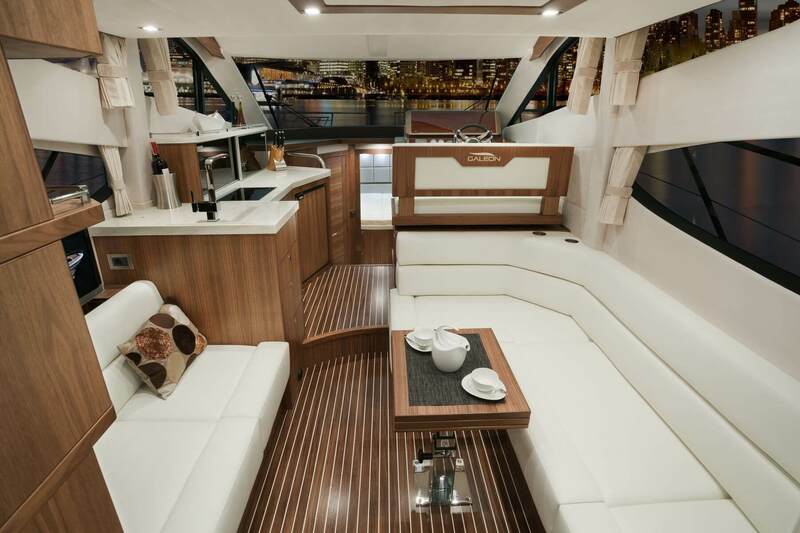 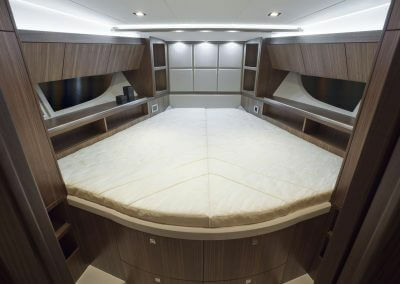 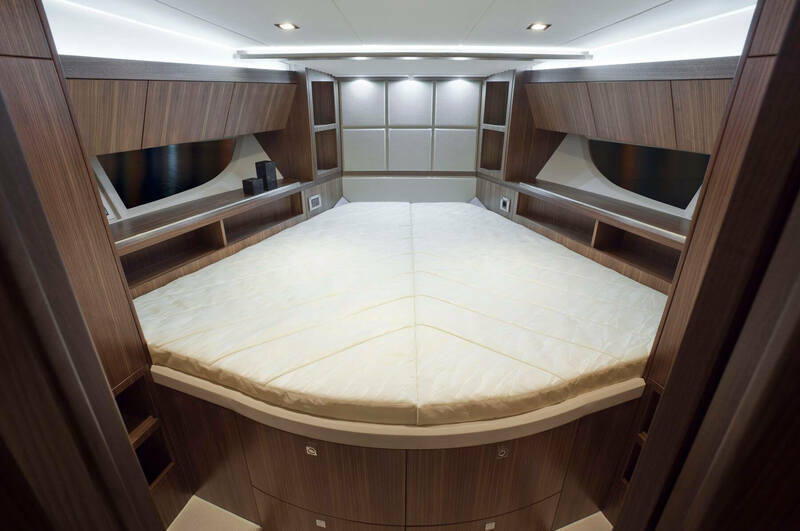 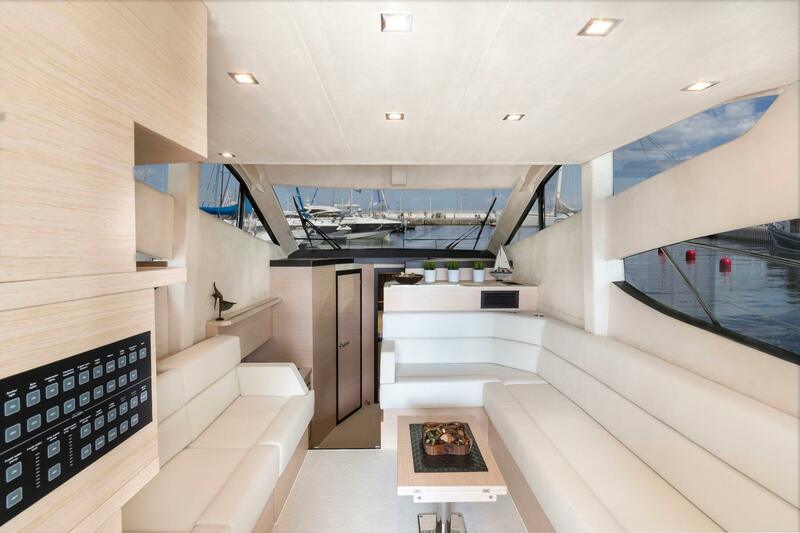 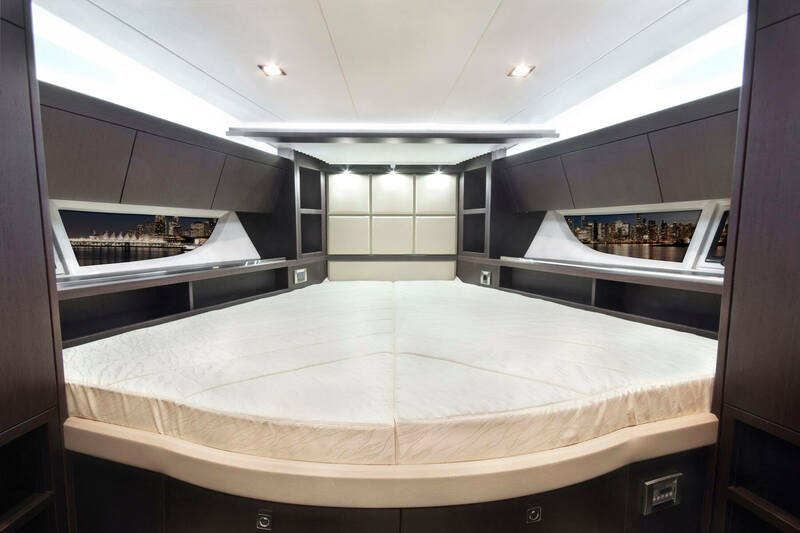 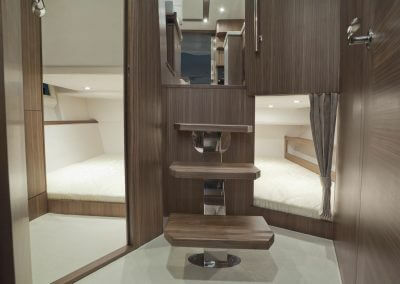 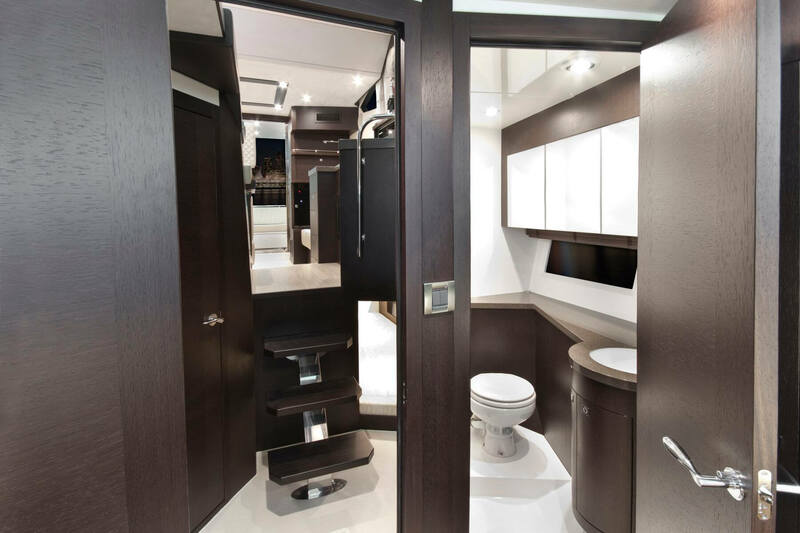 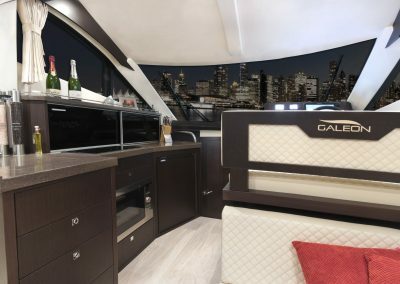 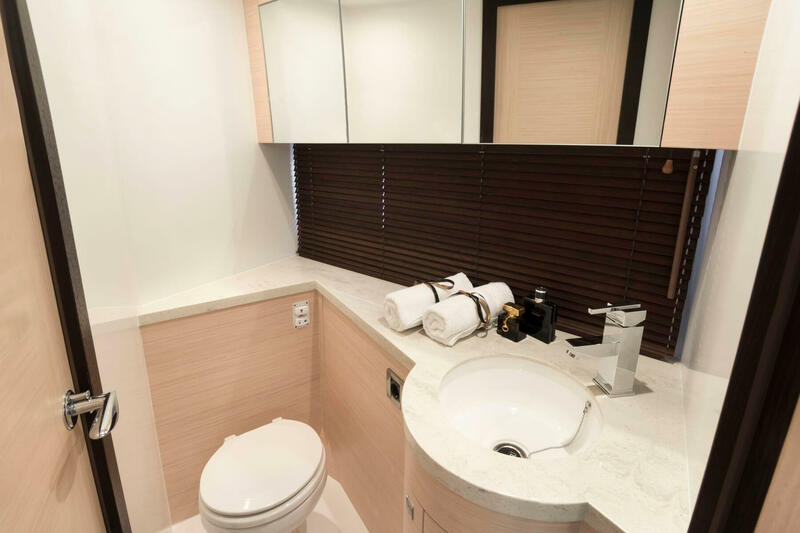 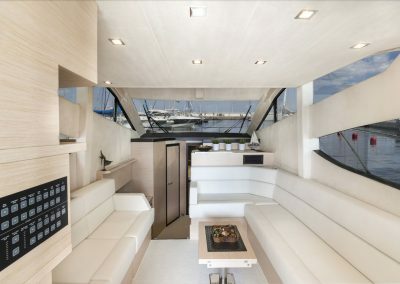 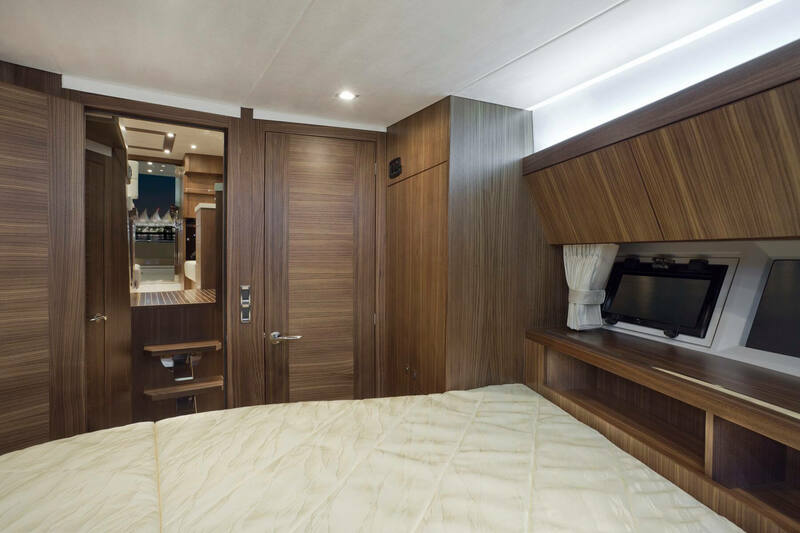 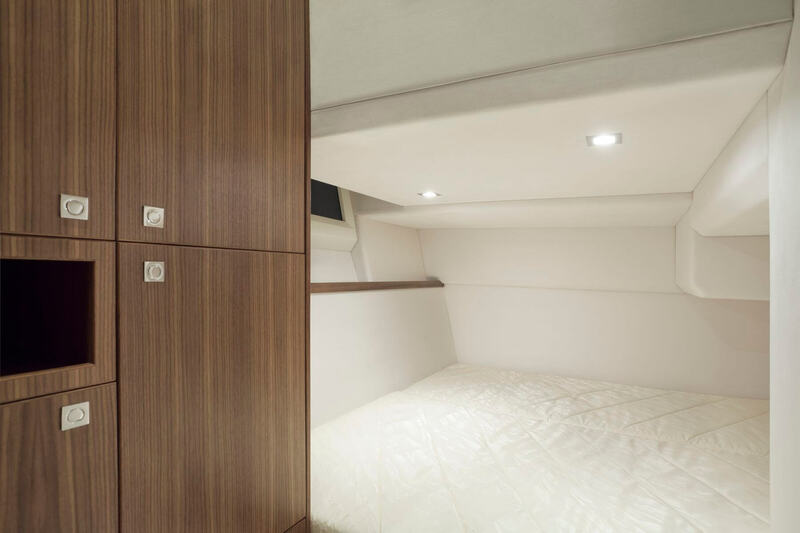 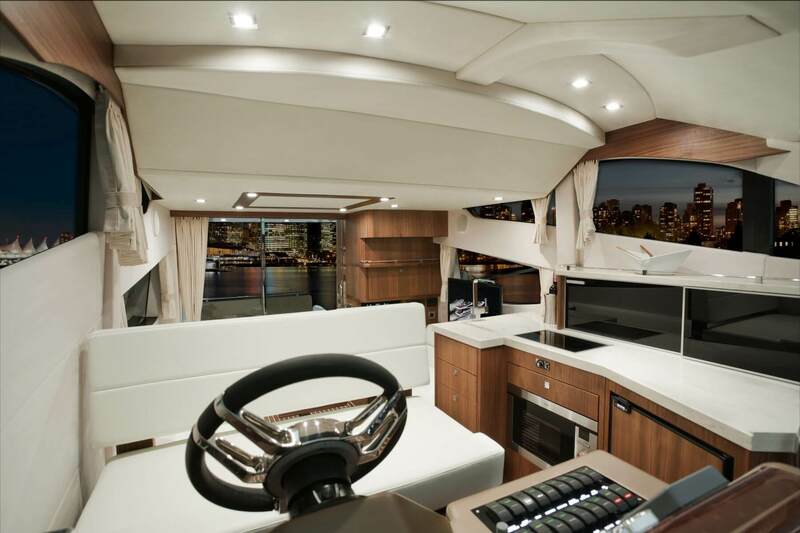 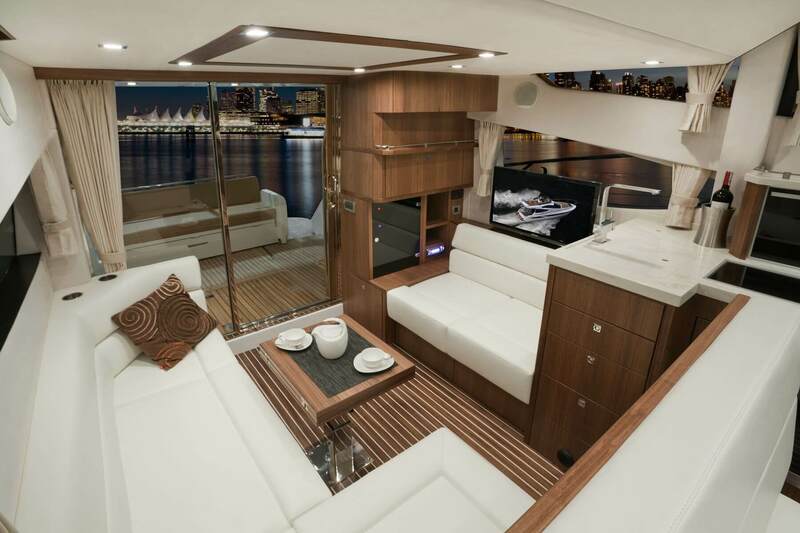 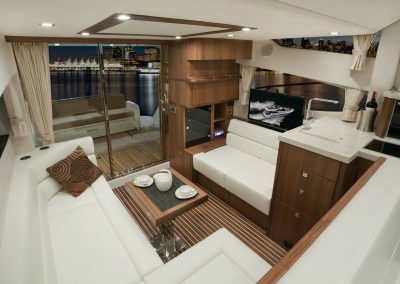 A plethora of interior design options with a choice of high-quality natural woods will allow you to fully customize the yacht to suit your needs. 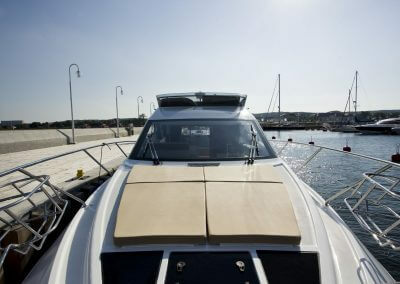 Up top, the foldable radar arch and mast allow for an easier passage under bridges and other obstacles. 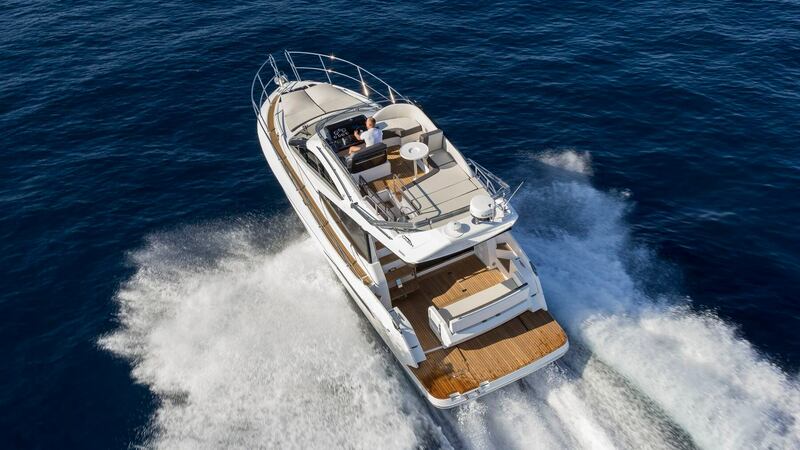 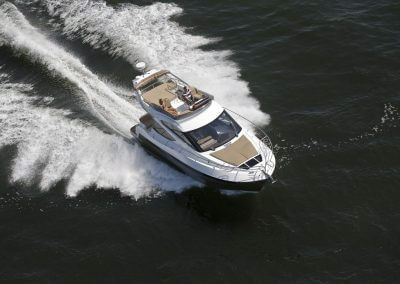 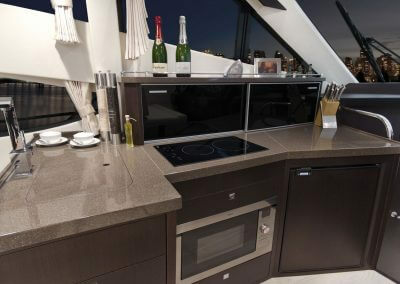 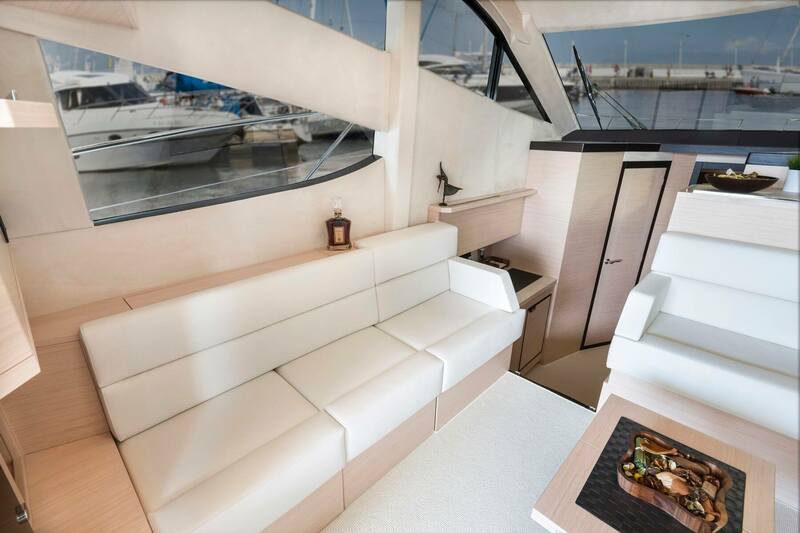 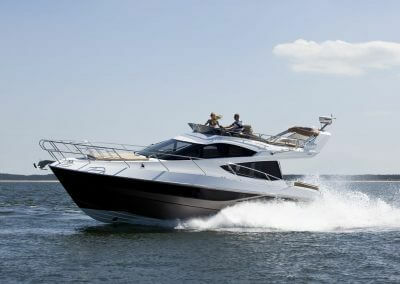 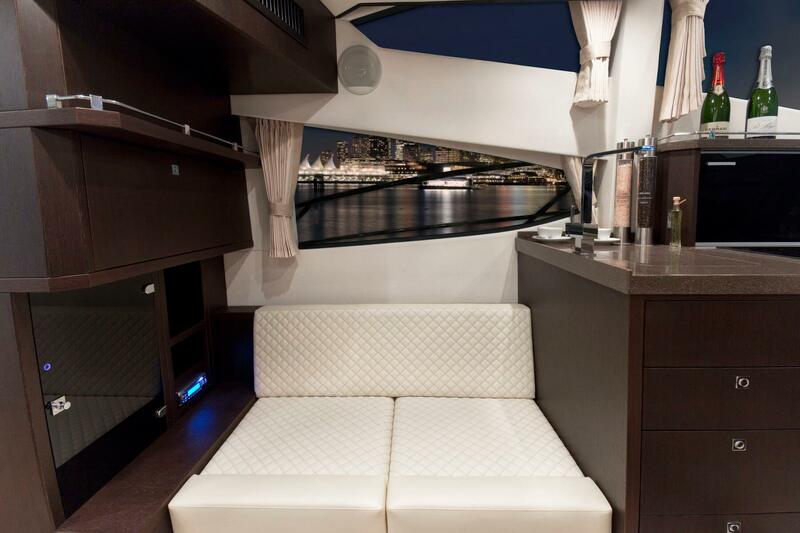 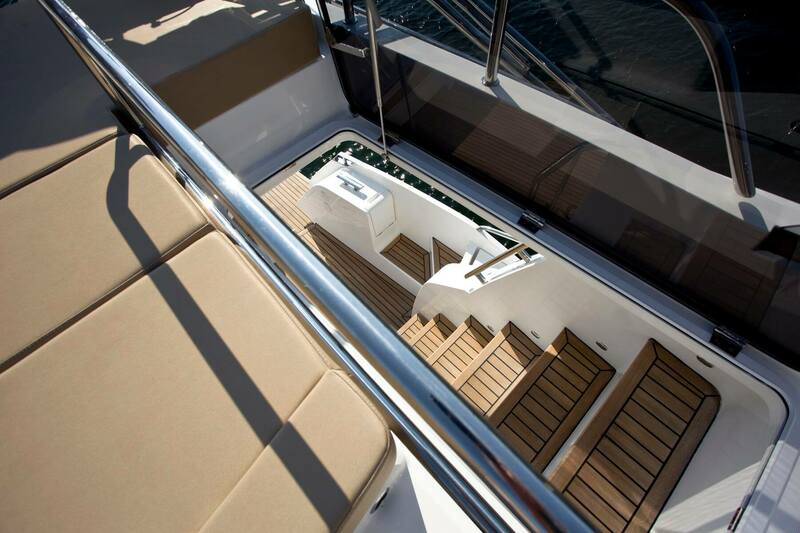 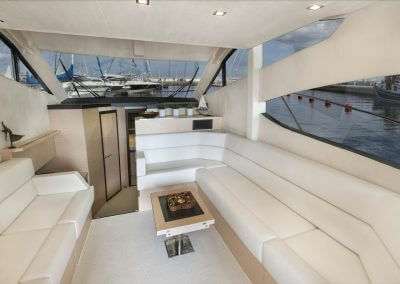 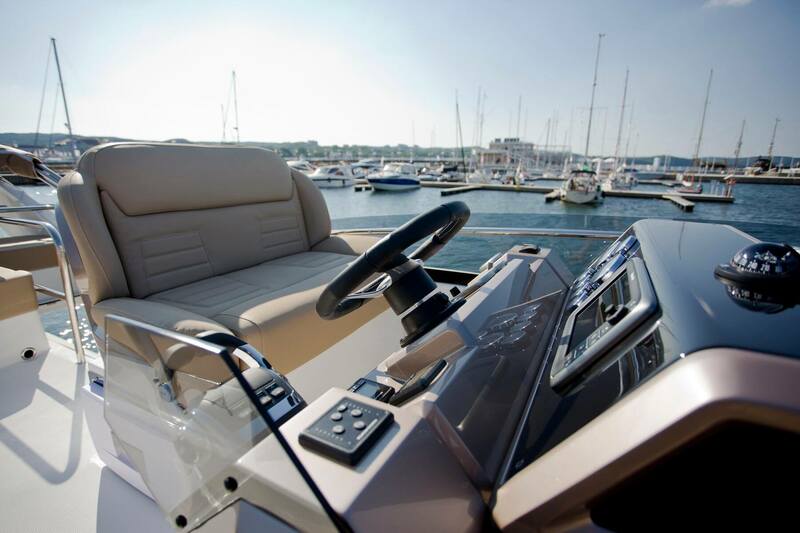 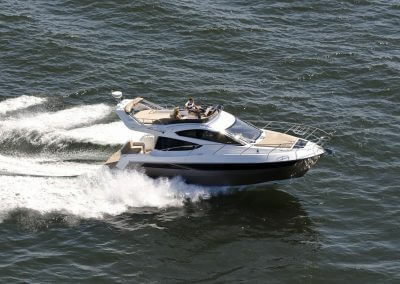 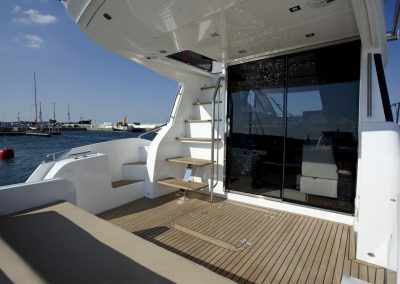 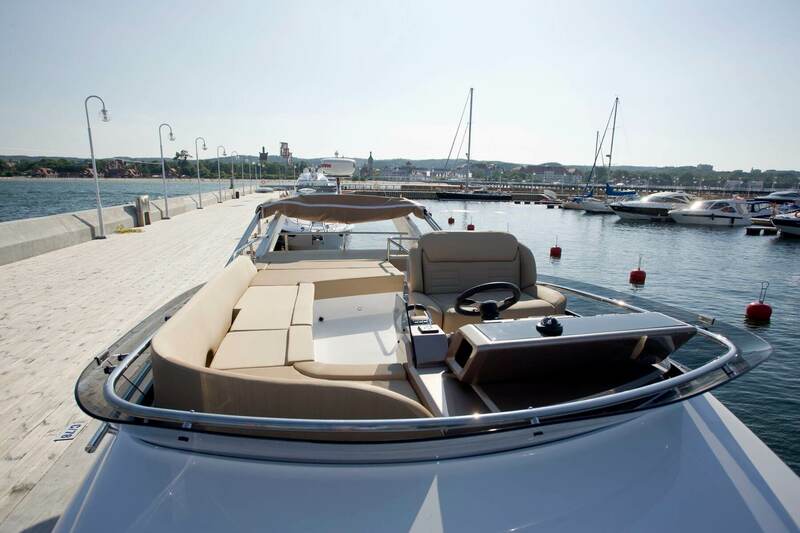 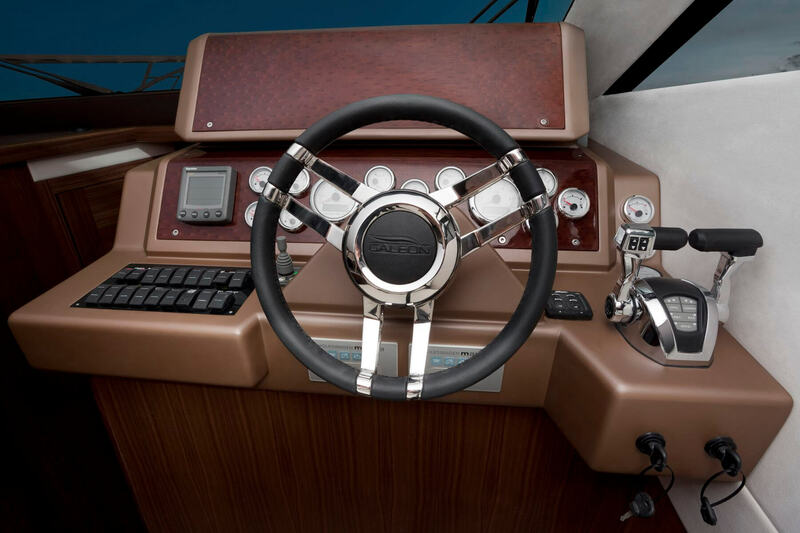 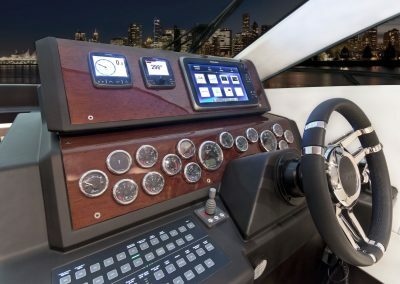 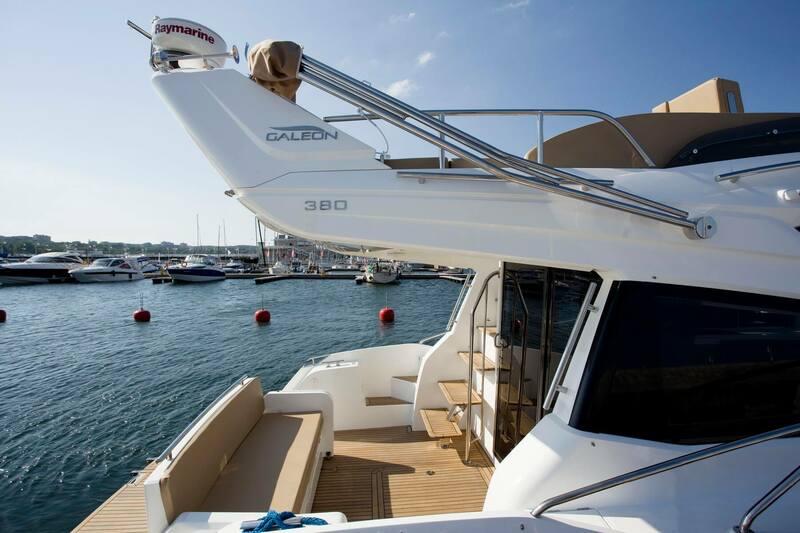 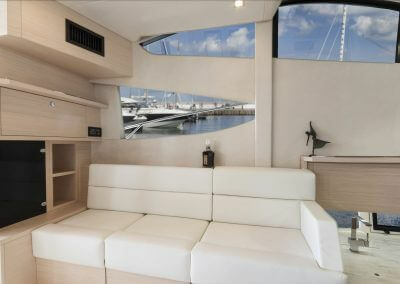 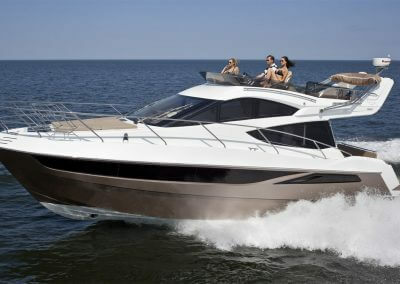 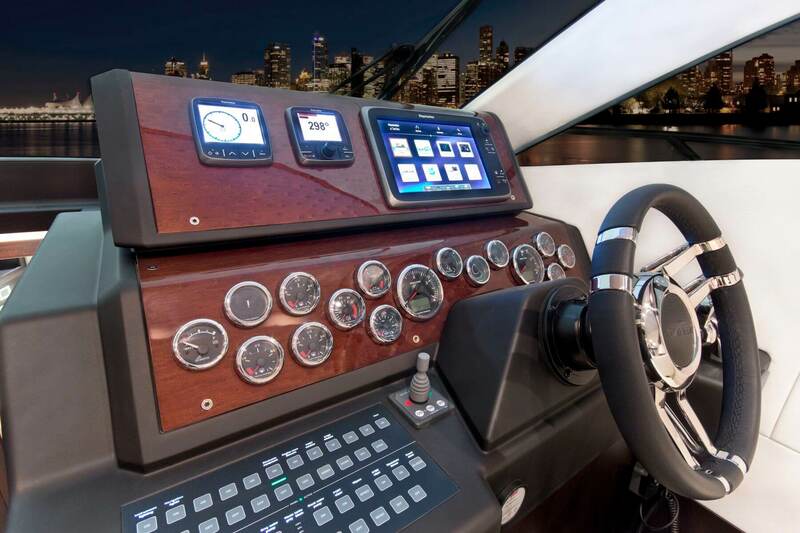 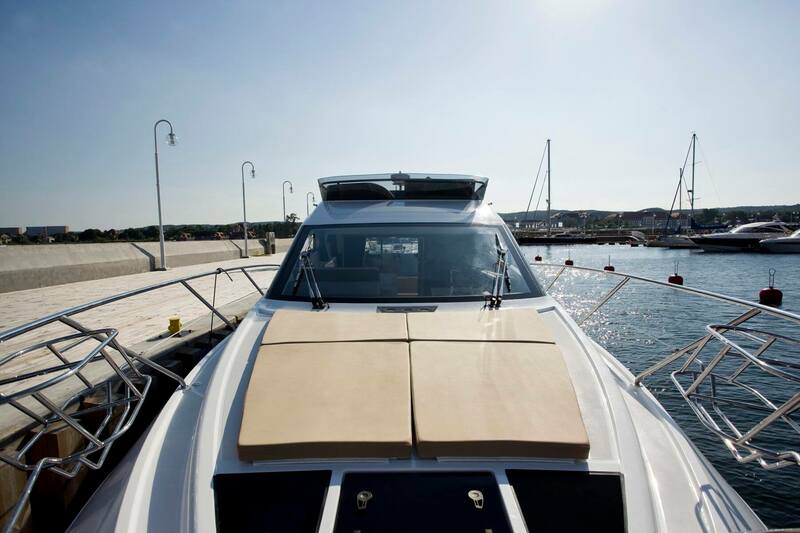 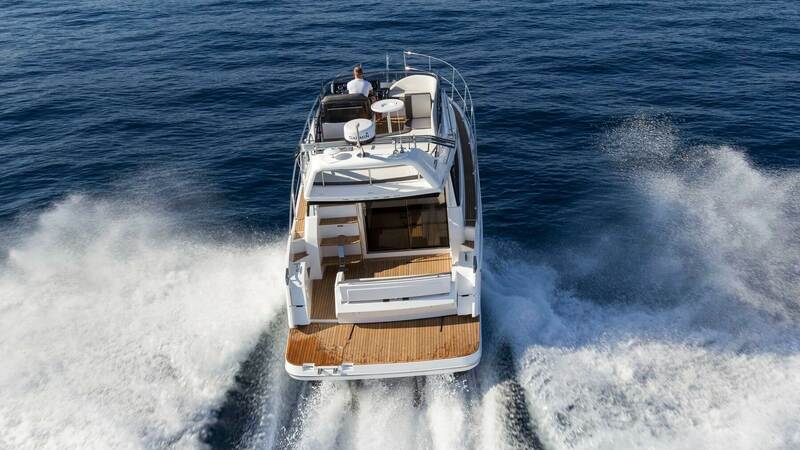 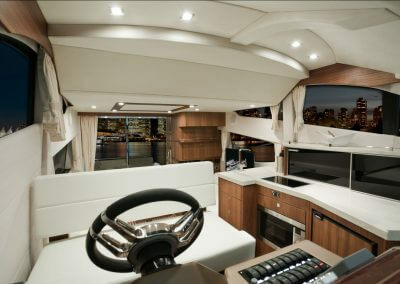 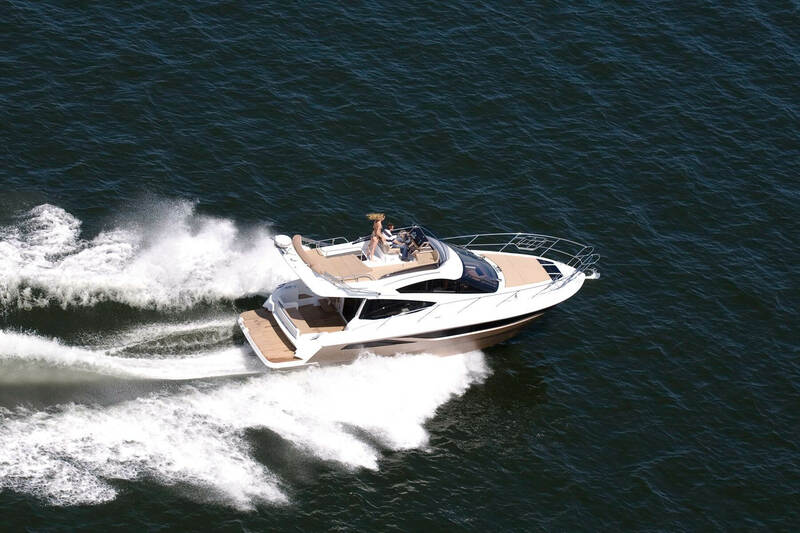 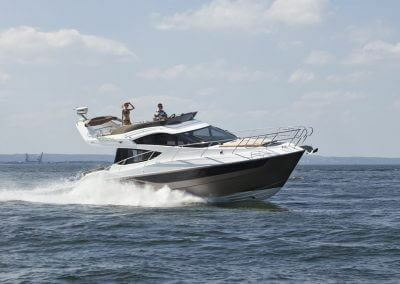 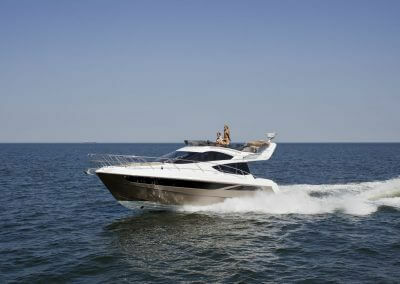 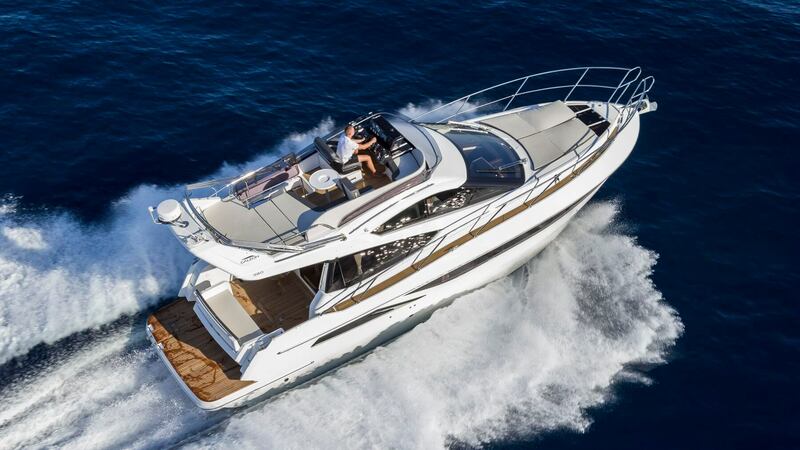 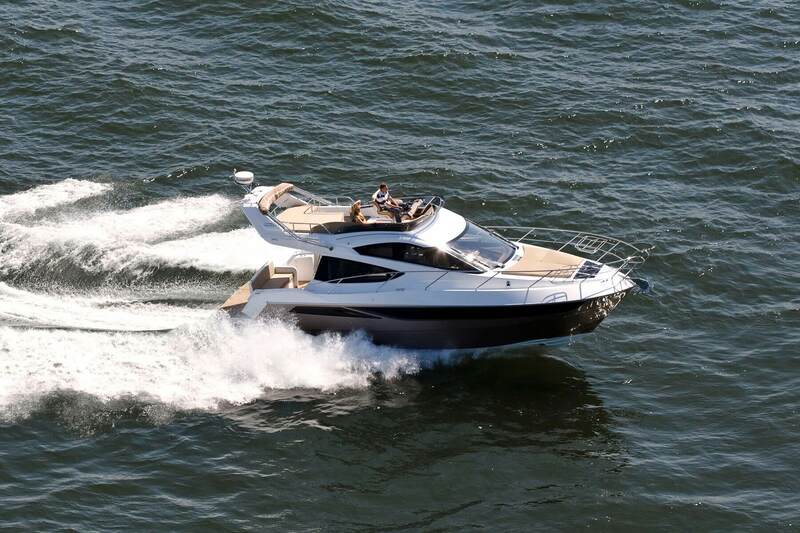 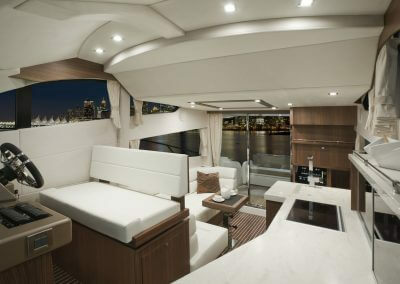 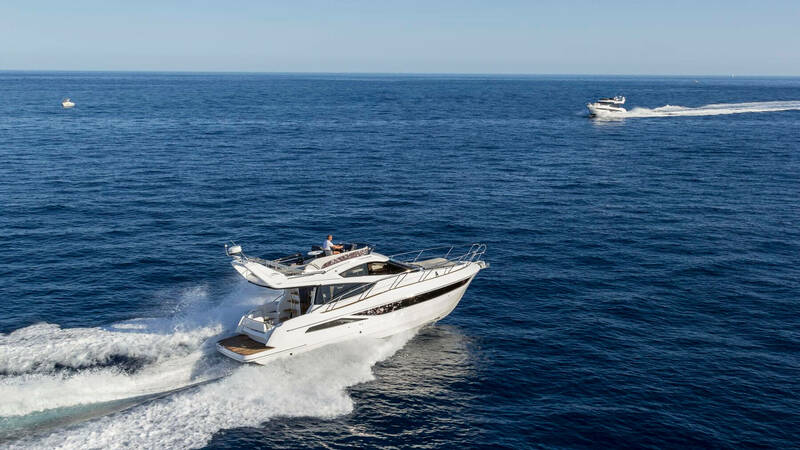 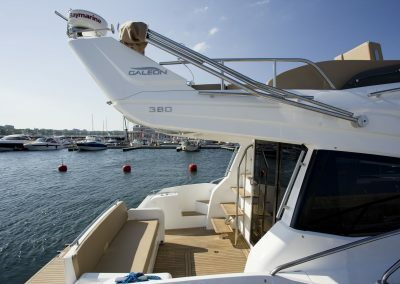 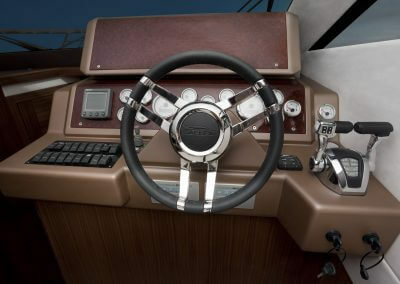 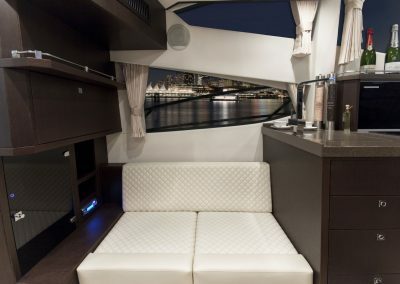 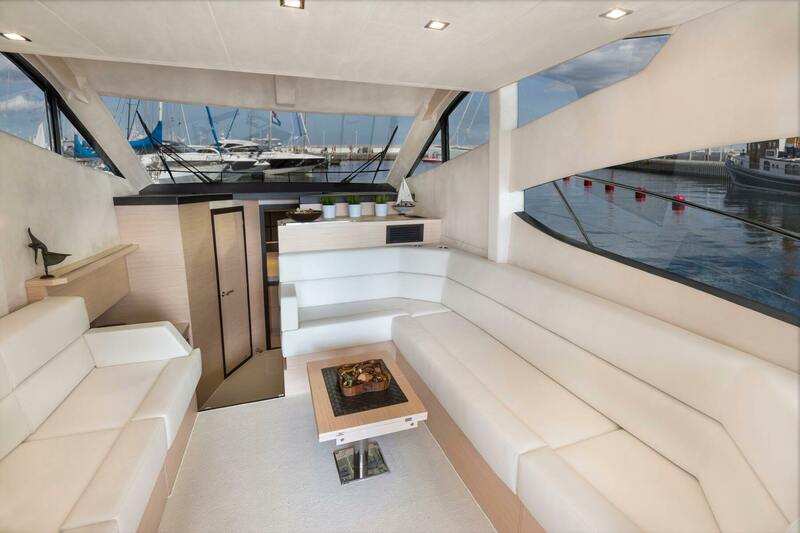 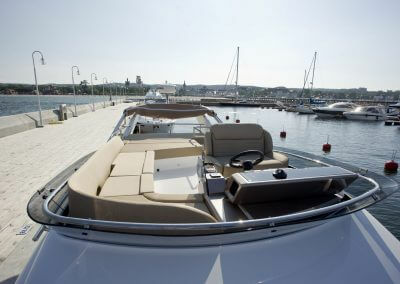 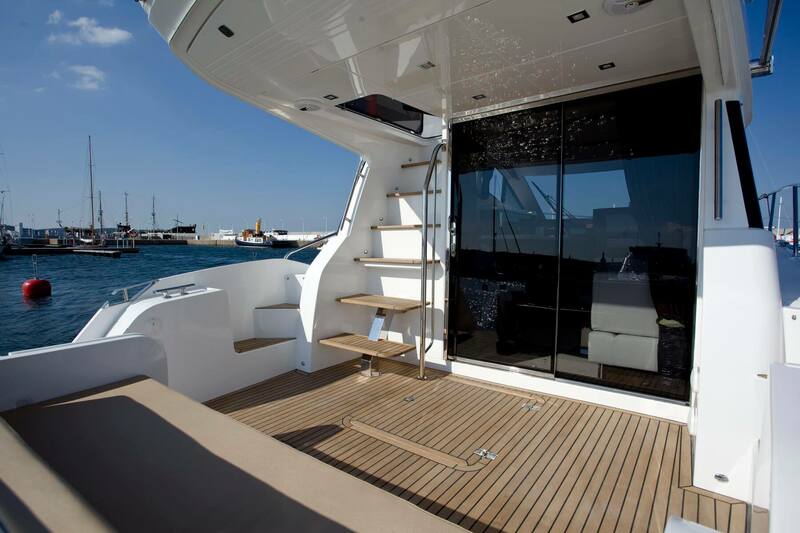 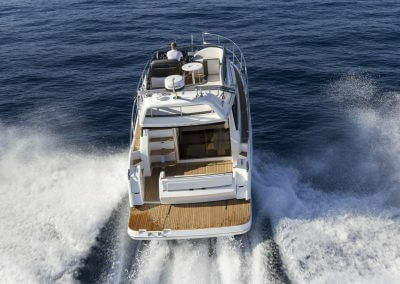 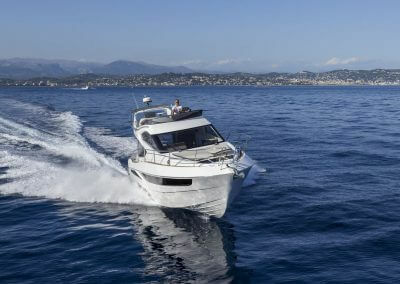 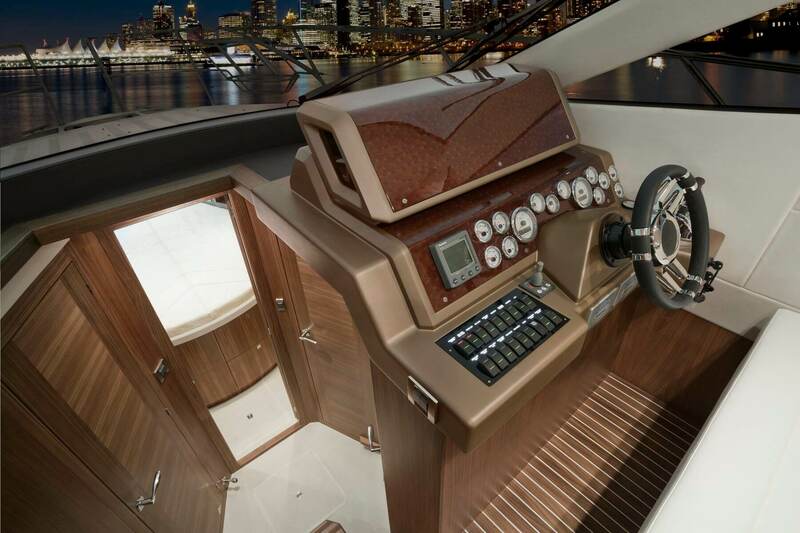 Take total command of the yacht from the top steering station or relax on the sundeck. Slide the glass doors in the cockpit to reveal a cozy salon suffused with natural light thanks to the drop down windows and a slightly tilted windshield made from a single sheet of glass. 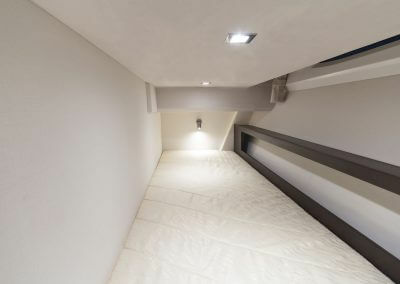 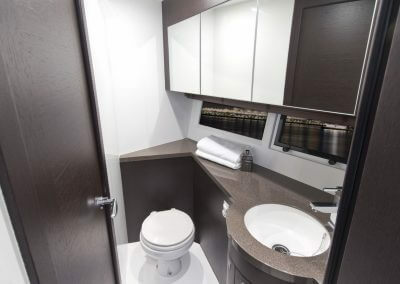 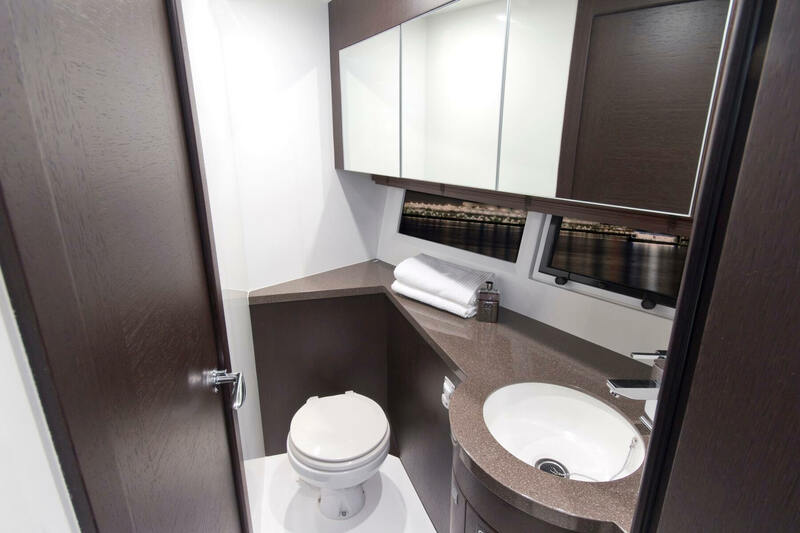 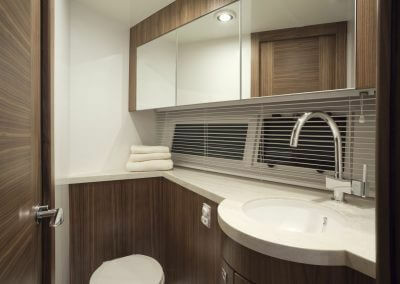 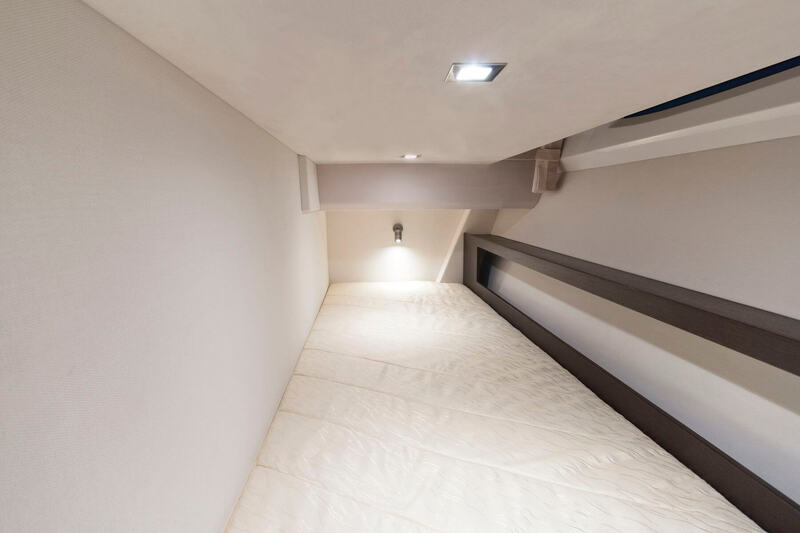 Down below, find up to three cabins with a separated shower and toilet to ensure comfort and privacy. 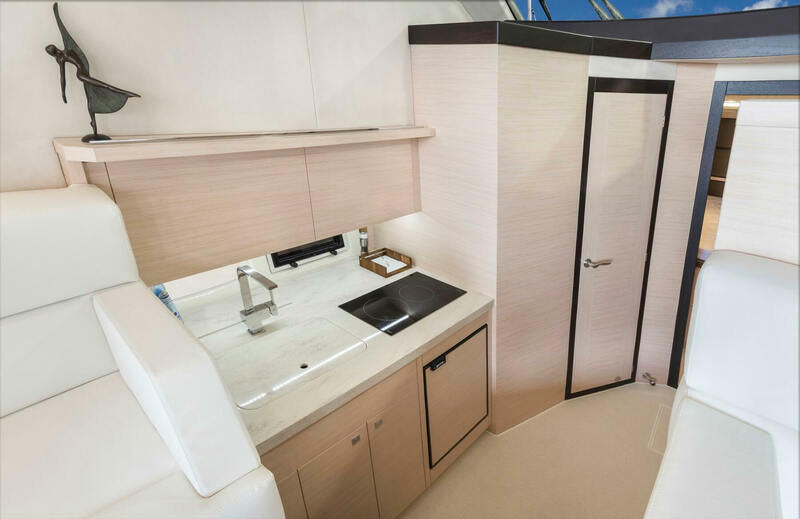 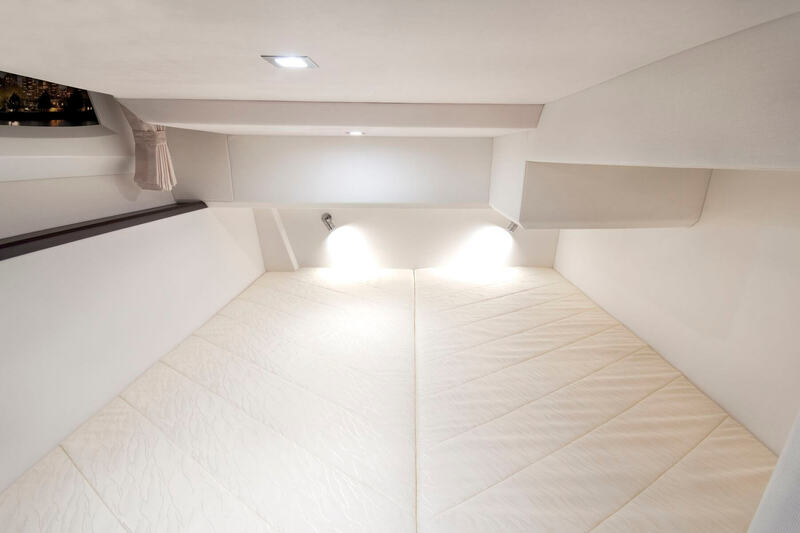 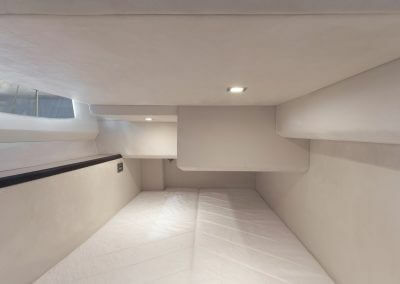 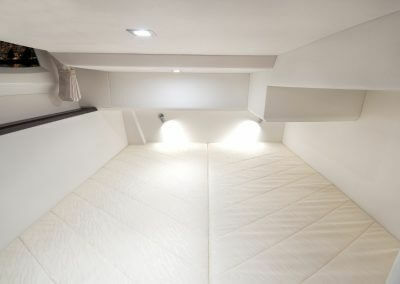 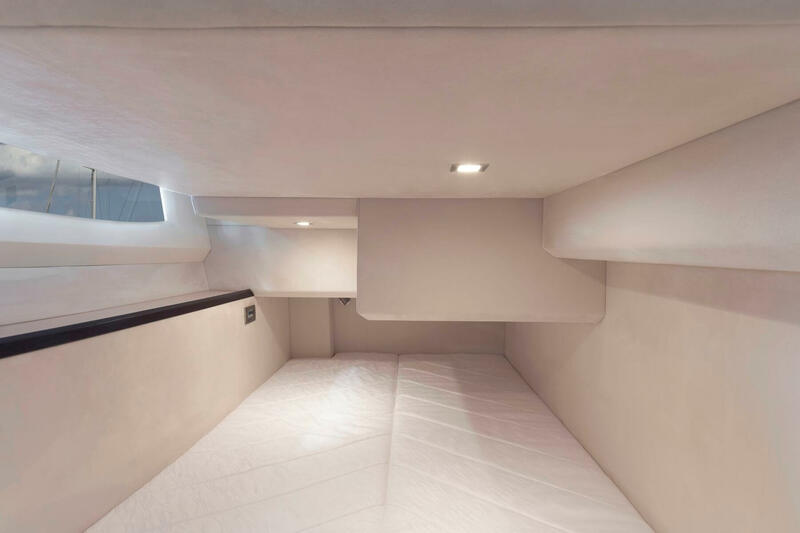 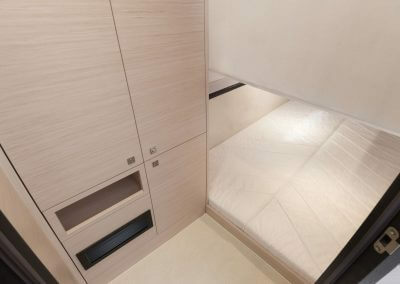 The bow owner’s cabin is well lit, thanks to a skylight with an integrated hatch and offers numerous storage compartments. 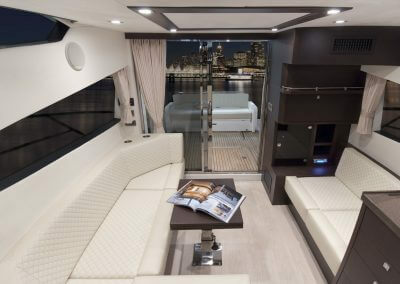 Exceptional design, pure comfort and ultimate convenience – the 380 FLY has it all.